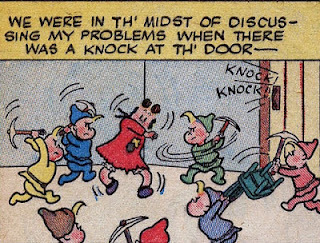 One of the small rewards of Dell Comics scholarship is in spotting the myriad in-jokes and self-references in which the creators indulged themselves. 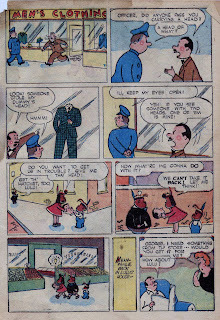 The writers and artists of Oskar Lebeck's Western Publishing staff delighted in putting one another's names--and caricatures--all over their comic-book stories. These references, given the general lack of documentation available at present, have become the only way we have to determine who's who in the Western world. 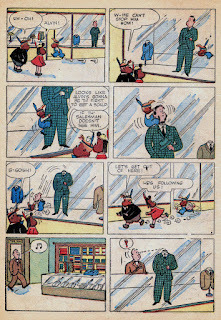 Michael Barrier has been exploring this phenomenon in his on-going research for an upcoming book on Lebeck and his genial comics empire--a book I can't wait to read. PLEASE NOTE: With this post, I'm trying a new way to distribute the comics material on this blog. Please see the notice at the bottom of this post. 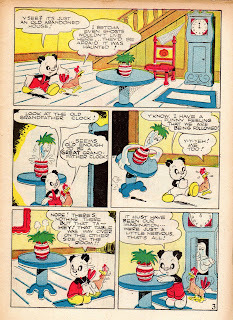 The text is full of spoilers, and is intended to be read after you've read the comics material discussed therein. After he left Little Lulu, John Stanley attempted to create several new comic-book series for his then-foundering publisher, Dell Comics. 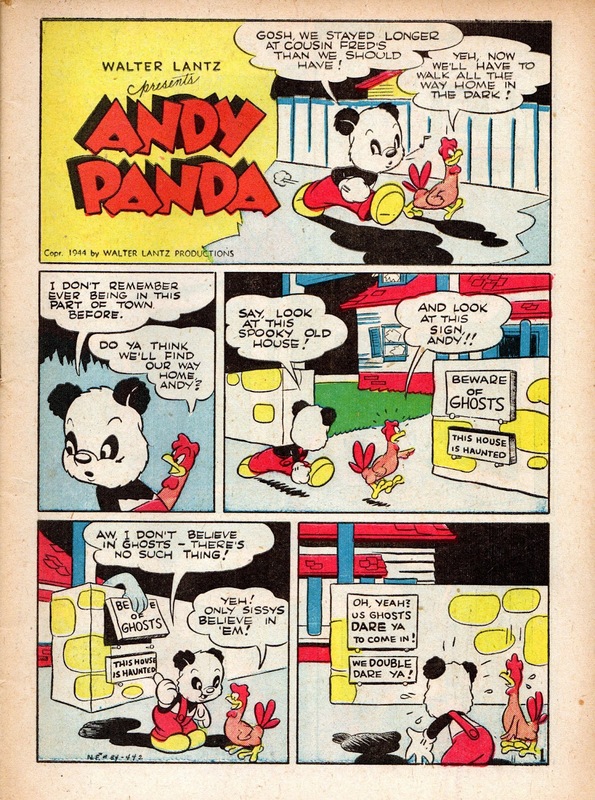 His old alma mater, Western Publications, had split from being the packager of Dell's best-selling comic magazines. 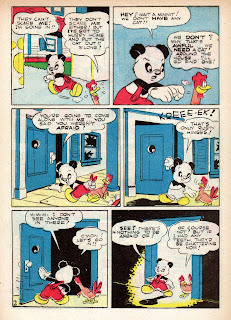 They formed Gold Key Comics, and swiftly went downhill (in terms of quality) and uphill (in terms of sales and success). For reasons yet unknown, Stanley chose to leave Western and produce new material for the struggling, rebuilt-from-scratch Dell imprint. Stripped of their long-running licensed titles and characters, the new Dell scrambled to get something distinctive on the highly competitive comic book market. 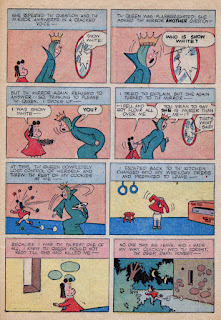 The hundreds of spontaneous fairy-tales that occur in John Stanley's Little Lulu offered their creator a constant, reliable escape route from formula. 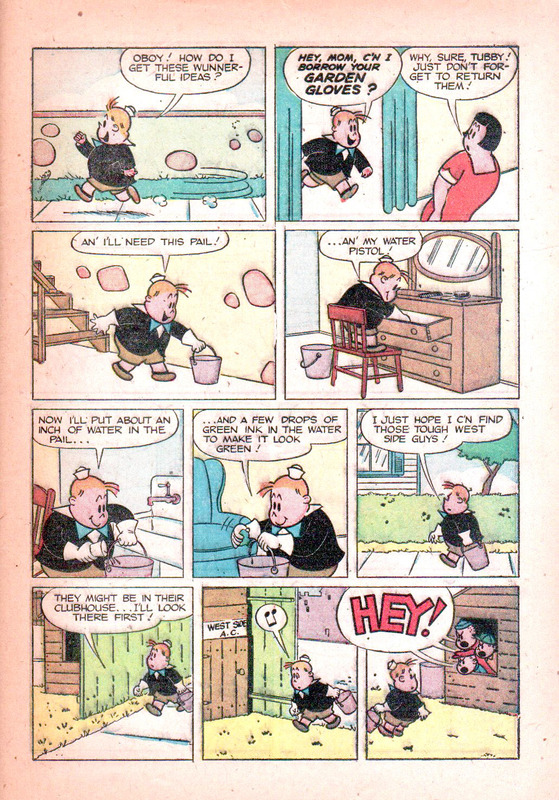 These playful comics-within-comics were, themselves, among Stanley's successful recipes for writing a popular monthly comic magazine. 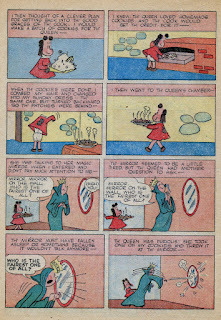 When the two stories presented here today first appeared in print, in two consecutive 1951 issues of Marge's Little Lulu, the title was among the best-selling newsstand publications in America. Stanley was in a position of great potential pressure. He created stories that children and adults read in equal measure, and on completely different planes of enjoyment. The responsibility might have psyched out anyone who stopped to think about it. 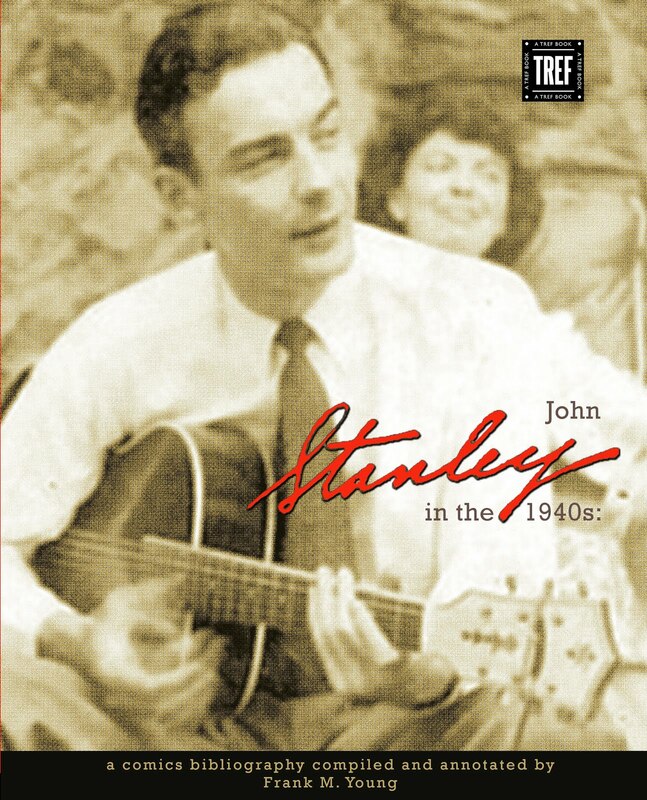 Most likely, John Stanley was simply too busy with the work to take stock of his position. Lulu, by dint of its high circulation, was potentially as influential a magazine as Life, Time or The Saturday Evening Post. 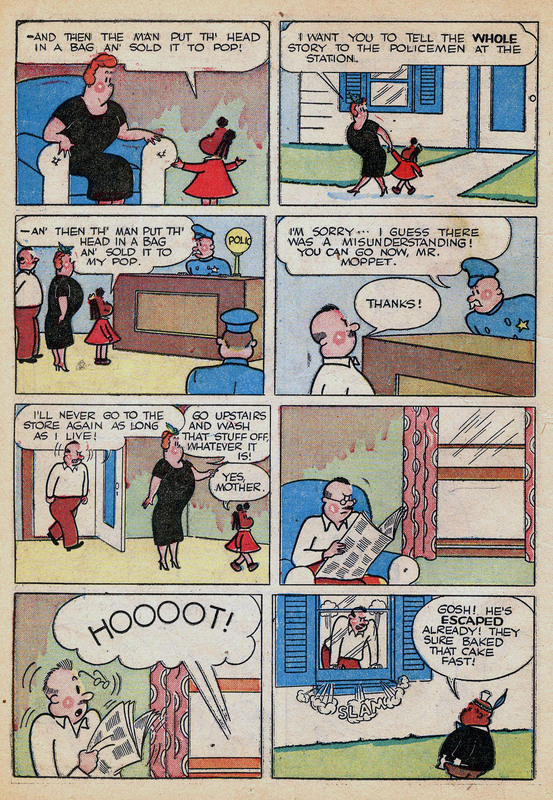 As a comic book, it, by no means, stood to change public opinion, or address crucial modern issues, as did those slick magazines. 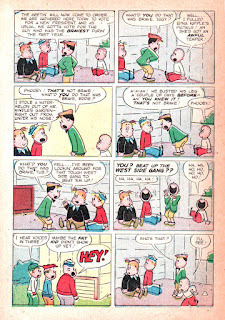 But it was as widely read, and its readership depended on its creative team to deliver the goods, month in, month out. 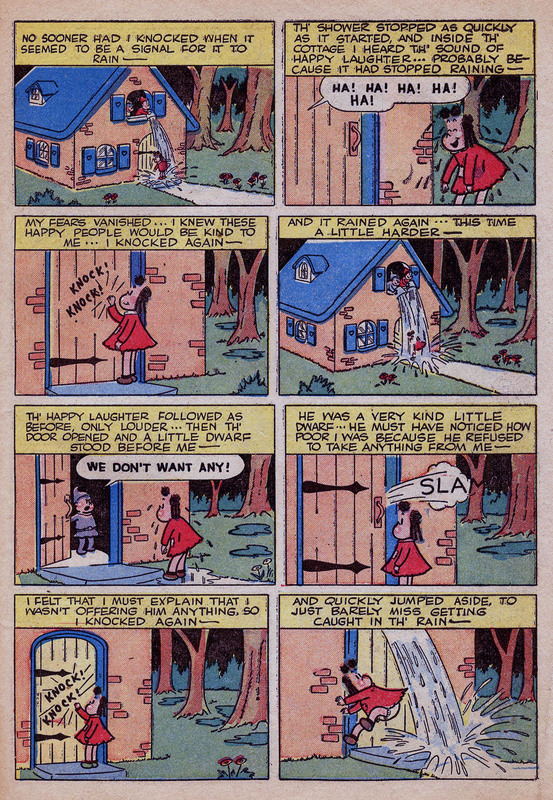 As is evident from even a quick reading, John Stanley was a bit burned out on Little Lulu in 1959. He had every right to be. Fifteen years of steady work on the series (including the companion title, Tubby) had yielded some 7,270 pages of comics--at least 700 of those also illustrated by him. 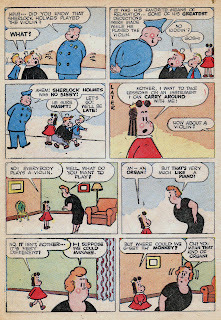 Lulu was continued by others, who followed Stanley's example to the letter, but without a vestige of the soul formerly present in the characters. 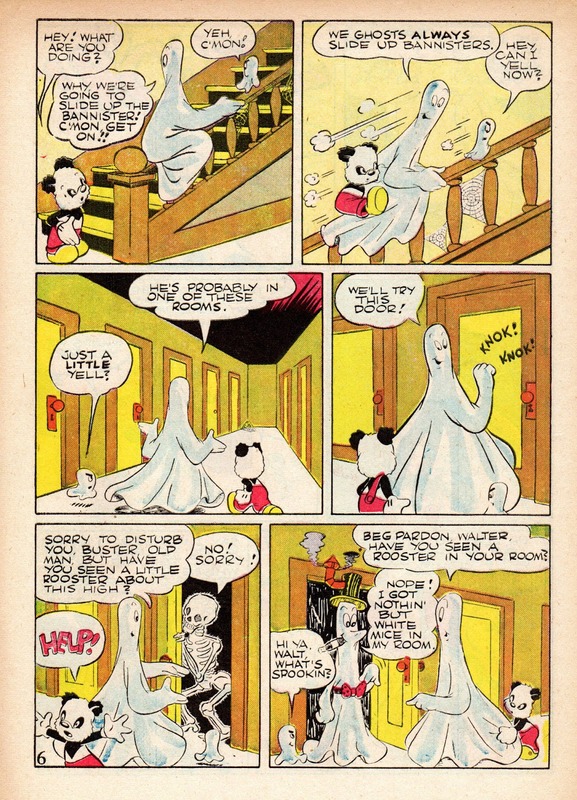 Someone at Western Publications had the brilliant idea that John Stanley should continue writing stories about kids, based on licensed properties. 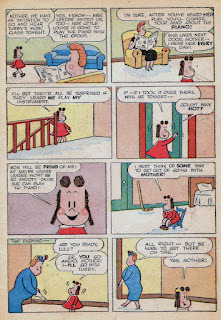 Having wrested rights to United Feature Syndicate's characters from UFS itself, Dell published a plethora of comics with the characters from Nancy, Peanuts and Captain and the Kids. 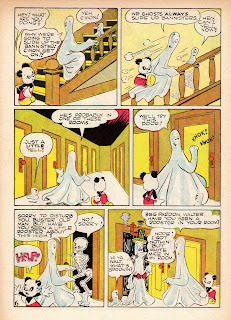 They ignored Gus Arriola's Gordo, which might have made a successful comic book transplantation, and apparently avoided Al Capp's Li'l Abner, which was a wise move. 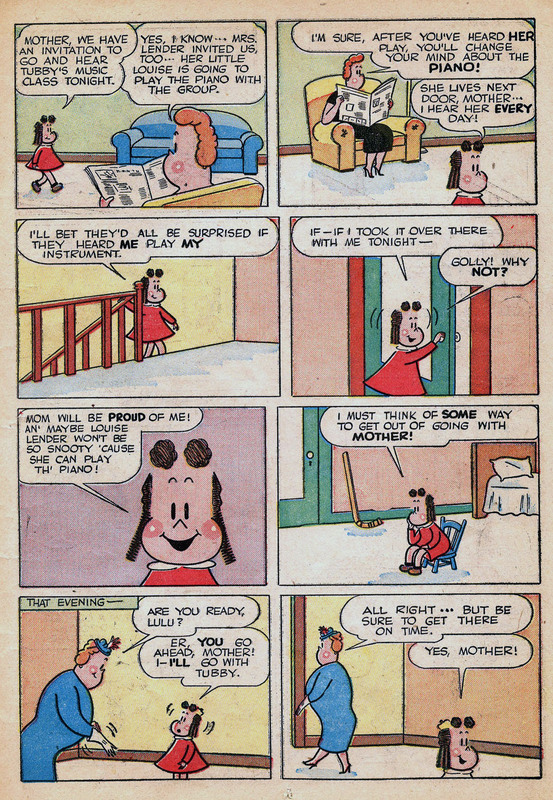 Nancy, as I've written here before, is really just Little Lulu sideways. One can sense John Stanley's frustration in still being asked to churn out stories about kids and the suburbs. A certain anger rises from the base of these stories. This anger breeds a brittle, edgy comedy, often laced with dark impulses, and peppered with open hostility from its adult characters to its children. On the other hand, Nancy gave Stanley a complete break from the heavy rules and regulations of Little Lulu. Though he was too careworn to run wild with this new property, he did approach it with a certain venomous vigor. 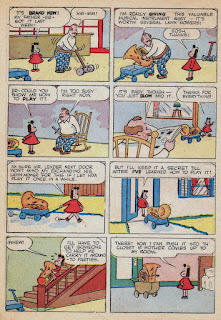 John Stanley co-opted the "Tom and Jerry" feature in Our Gang Comics in 1945. For a few precious stories, he converted it into a vehicle for an emerging, highly distinct and personal style of comic-book storytelling. 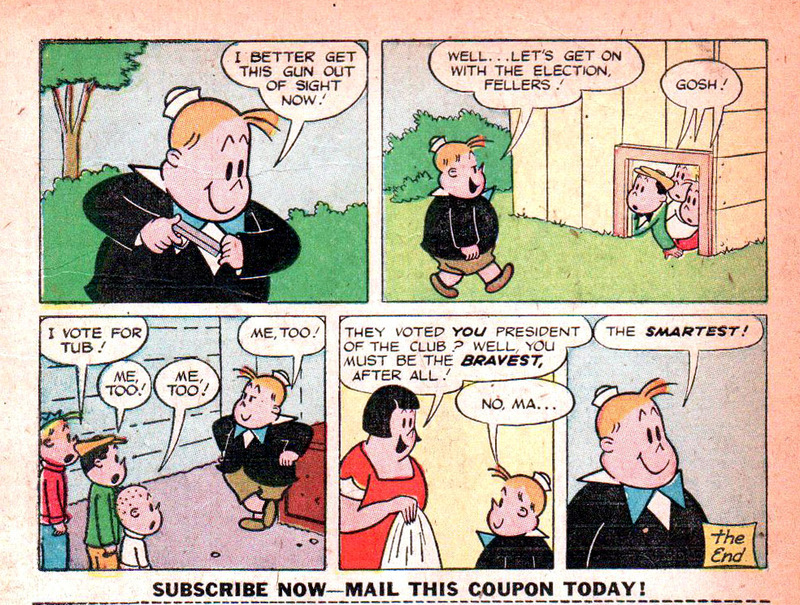 The results were ahead of their time, and sadly short-lived. 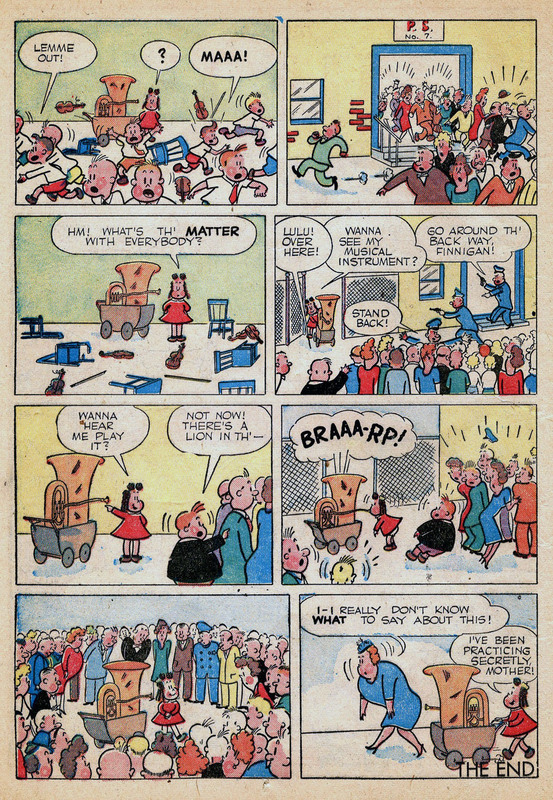 Stanley worked on the series from early 1943, and inherited it from writer Gaylord DuBois with issue 6 of the MGM-themed anthology, Our Gang Comics. Stanley contributed increasingly assured, sharp writing and cartooning to this series until early 1946. By then, another licensed property--the licensed property of his career--called on his full attention. 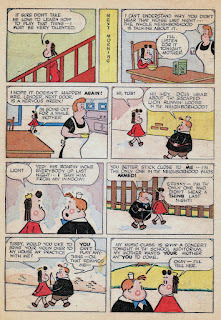 Little Lulu's growing popularity, as an original Dell comic book series, kept him busy producing 52-page comic books on his own, from script to art to lettering, in a constant series of one-shot editions. Before Lulu became a regular Dell comic book, Stanley had let go of much of the final rendering. Charles Hedinger came aboard in 1947, to be joined by Irving Tripp sometime in 1948. It's a pity that Stanley had to abandon "Tom and Jerry"-- he was on the verge of hitting a smart, hip and modern sensibility to comic books. He wouldn't get this vibe back until the early 1960s. 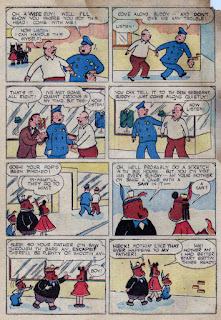 Flashes of the razor wit and keen observational comedy of Thirteen Going on Eighteen is seen in some 1945 T&J stories. 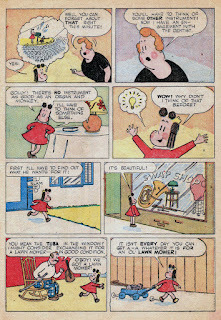 In the mid-1950s, John Stanley was fully occupied with his work on the best-selling Little Lulu and Tubby comic books. The potentially high-pressure demands of the job were tempered by a series of foolproof formulas he concocted for the Lulu stories. Stanley had a number of sturdy structures at his disposal. 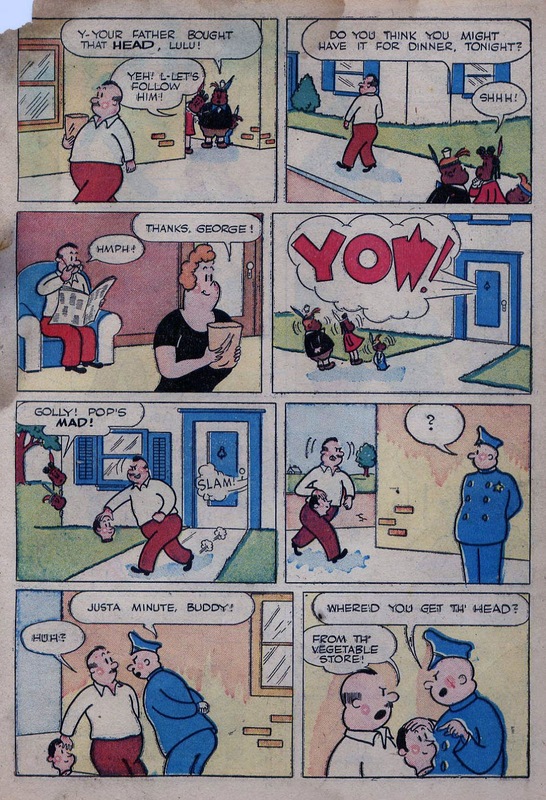 By 1955, he could pretty much fill in the blanks of a series of self-generated "Mad-Libs"-style scenarios and produce high-quality comic book stories. This didn't leave him much room for experimentation. 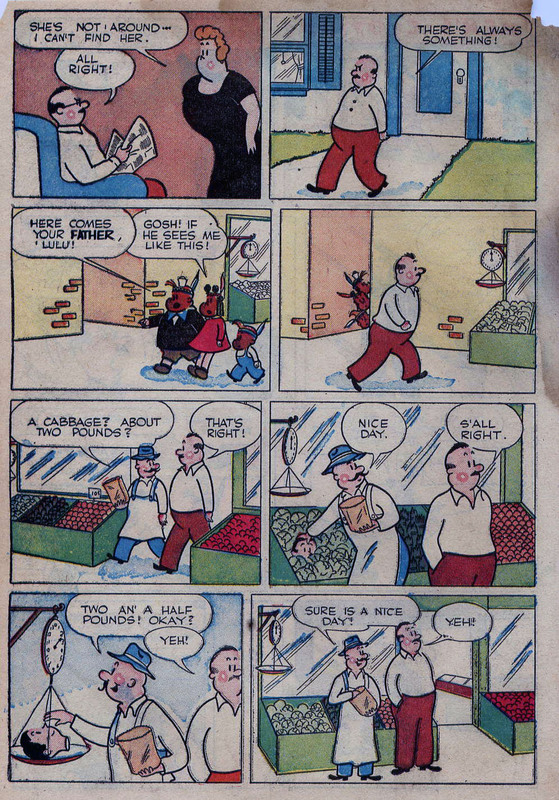 The 1950s were Stanley's most domesticated years as a comics storyteller. And while his Lulu work is uniformly strong, at times one can feel him in creative doldrums. 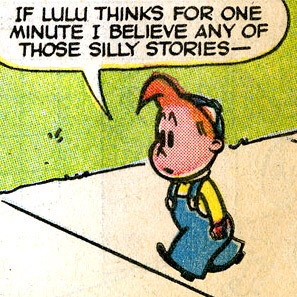 Little Lulu didn't accommodate all the facets of his storytelling and comedy. For a period of two years, he tempered this with a series of wildly imaginative stories for the satellite book, Tubby, which he wrote and drew. 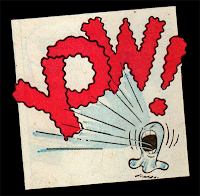 The energy and focus required by total cartooning was apparently too much for Stanley. He laid down his pen and brush in 1956, not to touch it again until 1963. 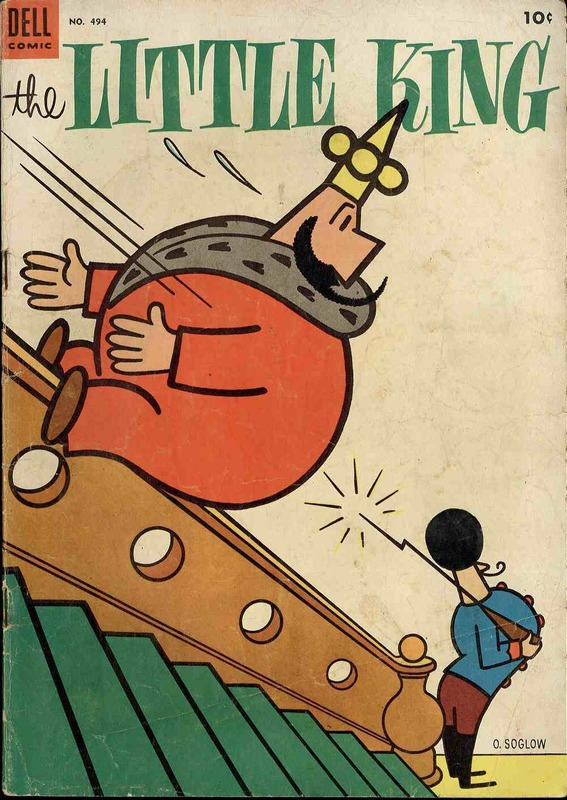 Among the few outlets afforded him, in this Lulu-centric phase of his career, were a trio of spirited, delightful one-shot books based on O. Soglow's pantomime newspaper strip The Little King. 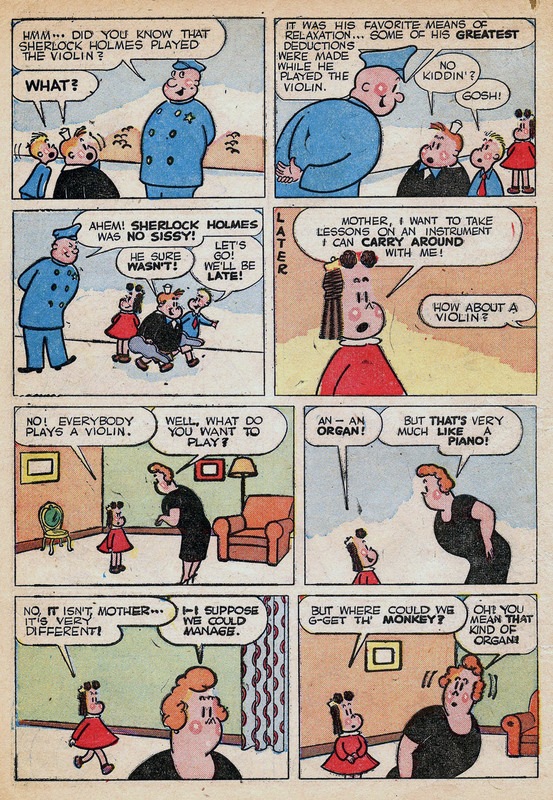 These comics mark the first faint inklings of John Stanley's 1960s sensibility. He clearly strives for something beyond the Lulu and Tubby stories he produced like a machine. 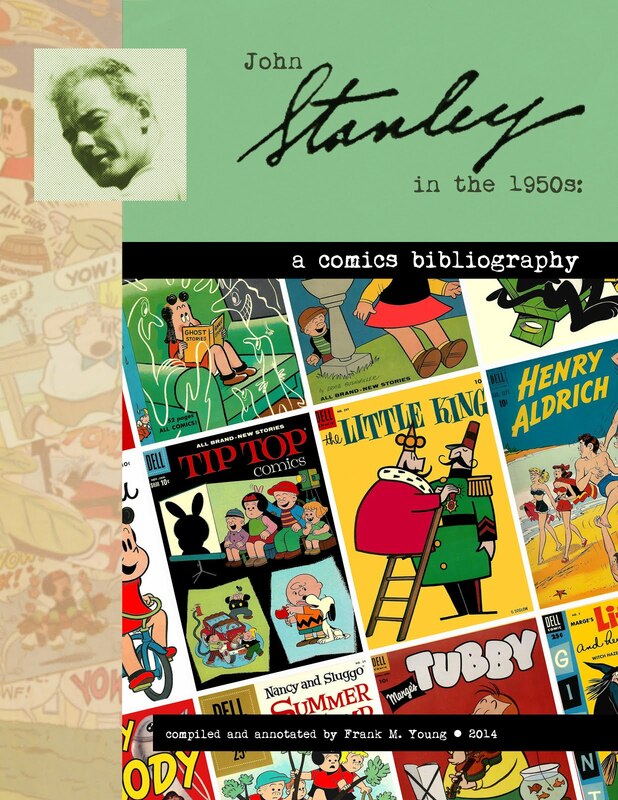 It's getting tougher to find something suitable to present to you, here at Stanley Stories. Yet there are a still new-to-blog goodies lurking in ye olde archives. People seemed to dig the previous two Clyde Crashcup posts. Thus, lightning strikes thrice and a post is born. I've said everything that needs saying about Clyde Crashcup, and where it fits in the John Stanley canon, elsewhere on the blog. John Stanley (and two of his finest artists, Irving Tripp and Bill Williams) seemed to enjoy themselves with this five-issue series. There's a genuine sense of fun in their DNA. 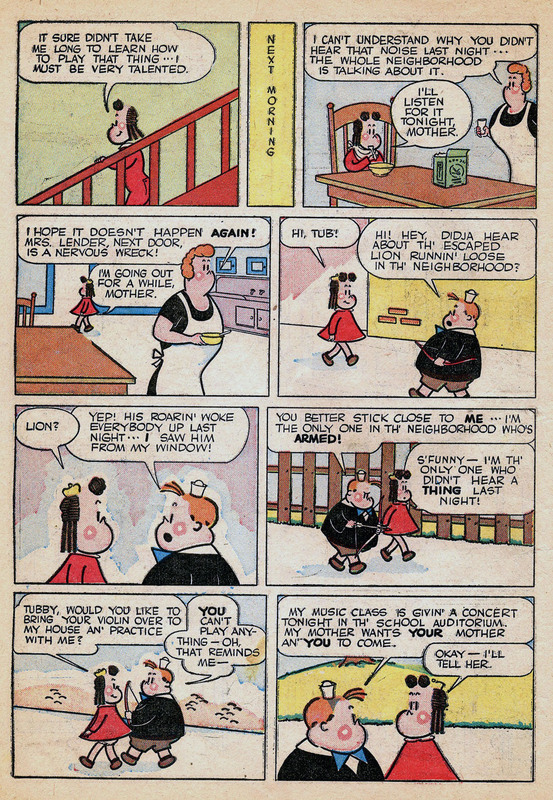 Much less joy is evident in other post-Little Lulu work-for-hire projects, such as New Terrytoons (and, arguably, the later run of Nancy and Sluggo). Crashcup's built-in Quixotic qualities were tailor made for the John Stanley sensibility. As well, the series offered catnip to its creator: a single situation that could be milked for endless variations. 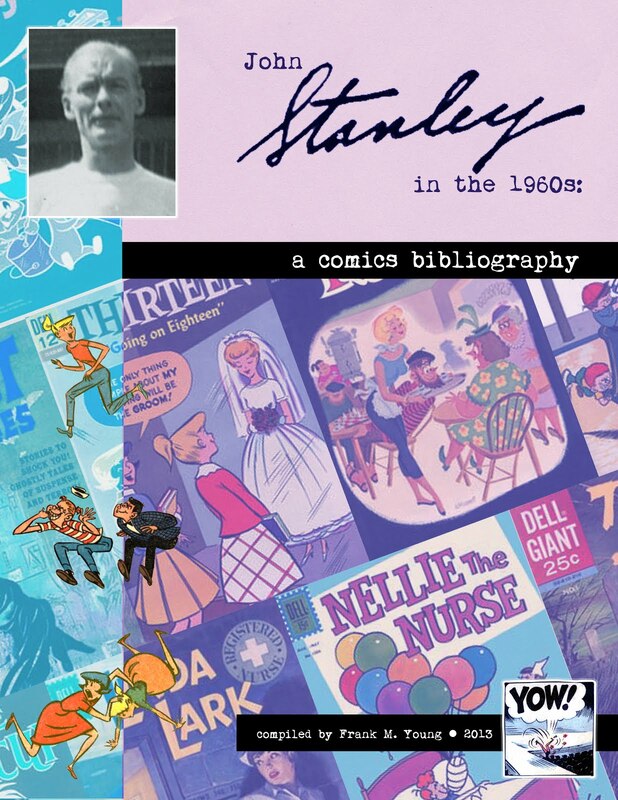 Thanks, once again, to the kindness of comics and animation historian nonpareil Michael Barrier, I'm able to share with you another rare early Stanley story. 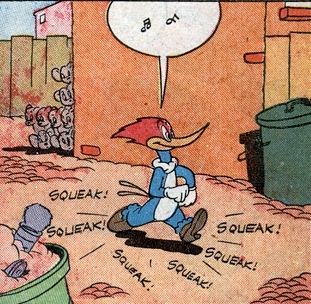 This is the second of his "Woody Woodpecker" stories. 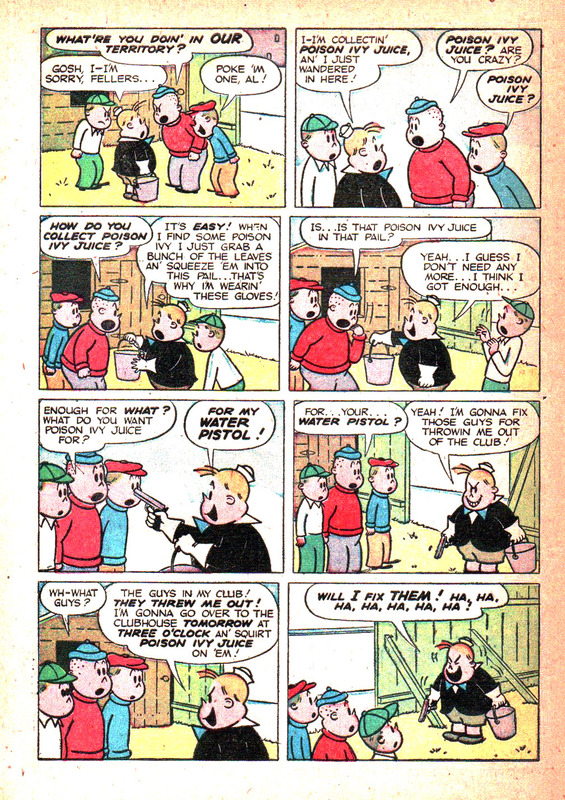 The first one, which appeared two issues earlier, can be found, in all its un-PC glory, here. 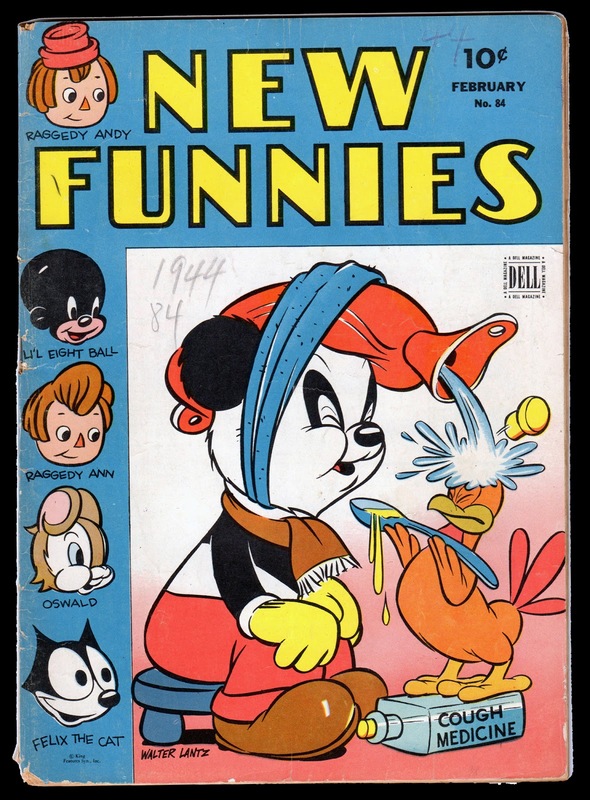 Woody was slow to appear in the pages of New Funnies--rather like Daffy Duck in the Looney Tunes and Merrie Melodies comic book produced for Dell in California. In several pre-Stanley issues, the woodpecker makes cameo stopovers in otherwise namby-pamby, cuddly-wuddly, icky-poo stories. In these tentative first appearances, Woody is nutty in a gormless way, and his lunacy is much gentler than his early animated persona. He is very clearly a puzzle to the unimaginative, bland creators of the pre-Stanley original material. Western's editors seemed initially shy about these screwball, anarchic characters. 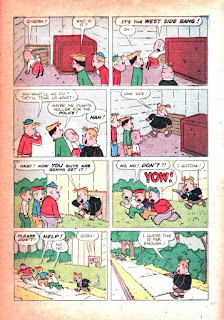 Perhaps they thought their reckless antics would have a negative influence on young readers. 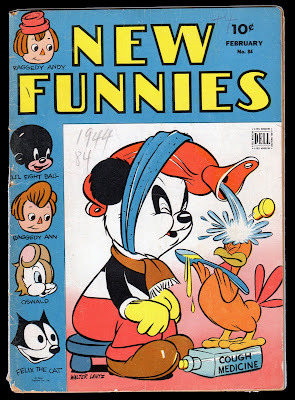 Far from it--these more lively, loose mischief makers were sorely needed to pep up otherwise stale funnybooks. 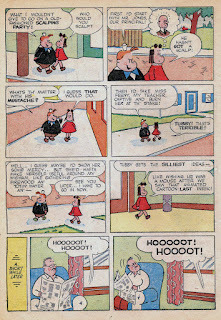 These more hard-hitting, screwloose figures, more in line with the official animated versions, no doubt helped make the Dell cartoon-based titles more popular. As I've said before, this is not a "Little Lulu" blog. 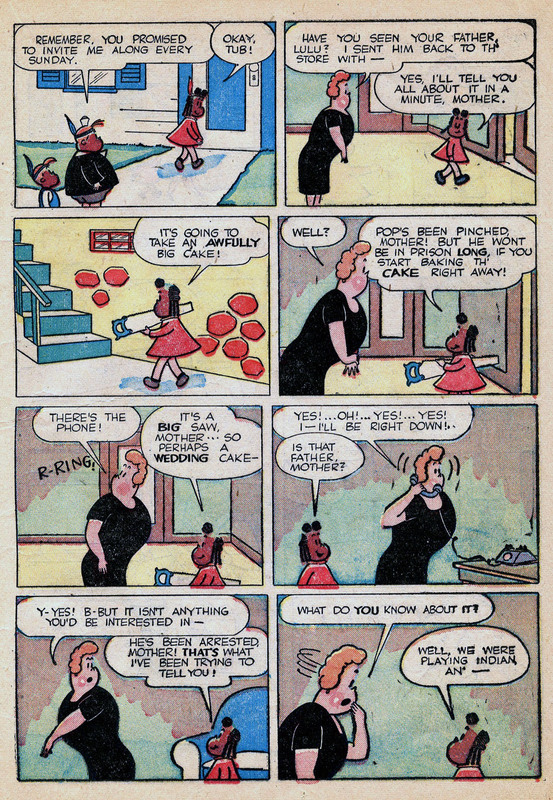 Aside from John Stanley's interpretation of the character, in his 14 years as writer-layout-cartoonist for the Dell Comics adaptation, Lulu rather leaves me cold. 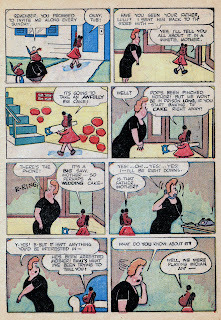 The background story of the creation of Marjorie Buell's "Little Lulu" is far more interesting than her actual work. She is a poor cartoonist, and a poor gag-writer, in my opinion. 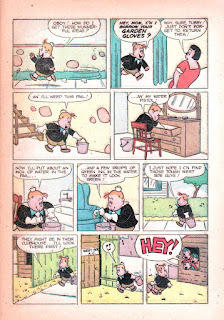 Despite the contemporary popularity of her magazine cartoons, time has not been kind to Buell's work. Her sheer lack of skill as a cartoonist and drafts-person gives the work a cheap, amateur-hour feeling. The character of Lulu never evolves beyond that of a one-dimensional prankster imp, whose misdeeds hide under a tin halo of childish innocence. 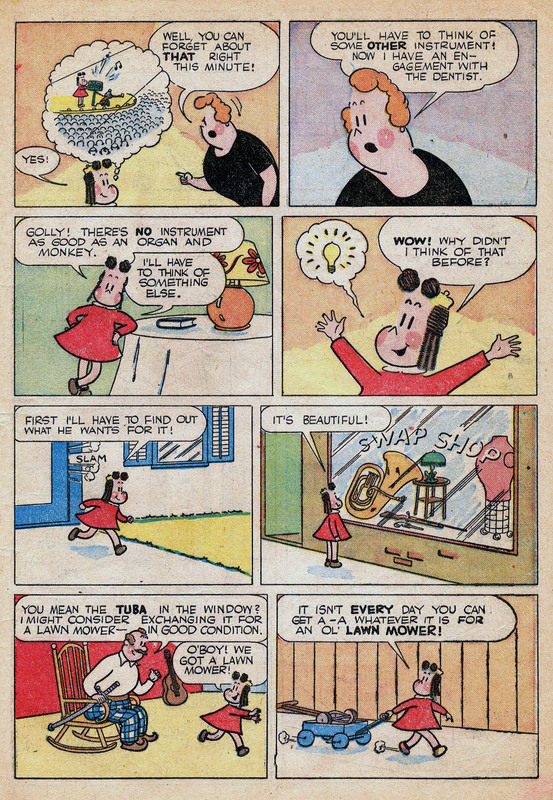 John Stanley worked a small miracle in his rethinking of the "Little Lulu" character and universe. He gave each character a highly developed, believable and rich personality. He also clearly defined their habitable world. 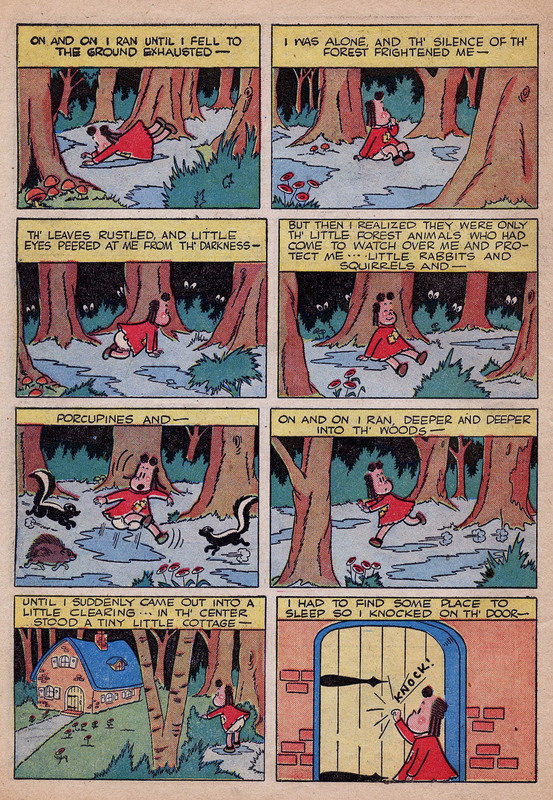 The Northeastern landscape of his "Lulu" is, itself, a major character in the Dell series. Marge Buell cared for nothing more than a quick laugh, dusted with a little bit of cloying charm. It was enough to delight the 1930s reading public. 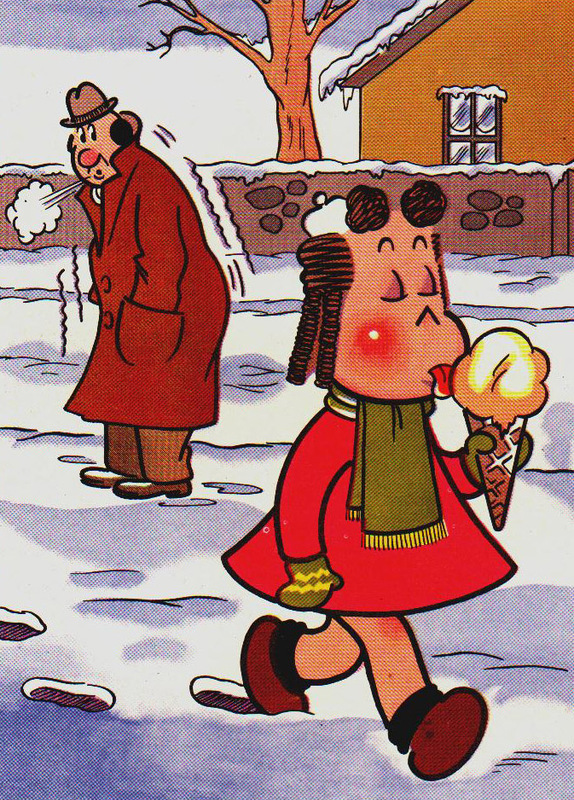 For the character to exist beyond the pantomime plane of the gag cartoon, Lulu needed substance in the worst way. 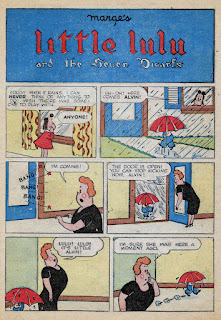 The first major adaptation of Buell's character precedes John Stanley's first Little Lulu comic book by almost two years. 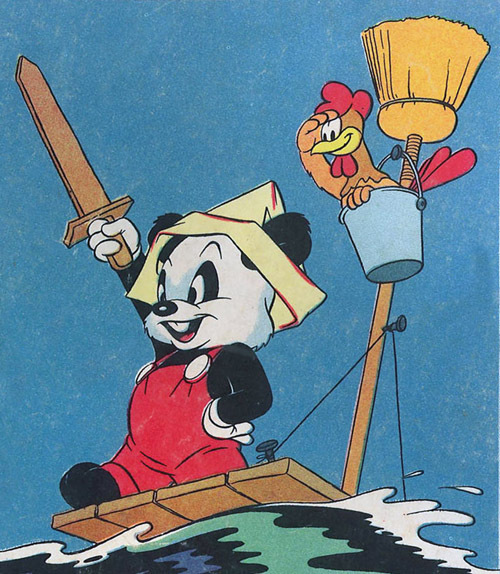 She appeared in 26 animated cartoons, produced from 1943 to '47 by New York-based animation house Famous Studios. 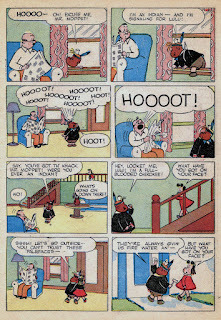 These cartoons clearly occupy a warm, nostalgic place in the hearts of many folks. 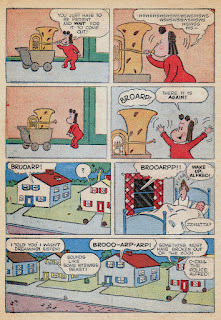 They compare and contrast with the greatest iteration of the Marge Buell characters--those done, in Dell comic books, by John Stanley, Irving Tripp, and others, from 1945 to 1959. 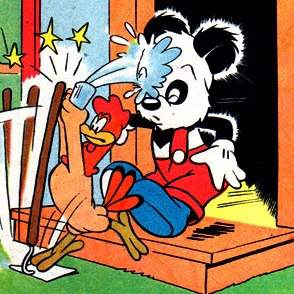 Those with starry-eyed fondness will not like much of my comments and reactions to the Famous Studios cartoons. 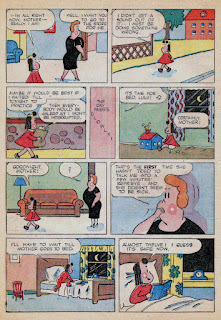 Had Stanley not done the subsequent comic book version--the iteration of Lulu with which I'm most familiar and grounded--perhaps these cartoons would seem less strange and off-kilter to me. That said, I am an admirer of the Famous Studios output. 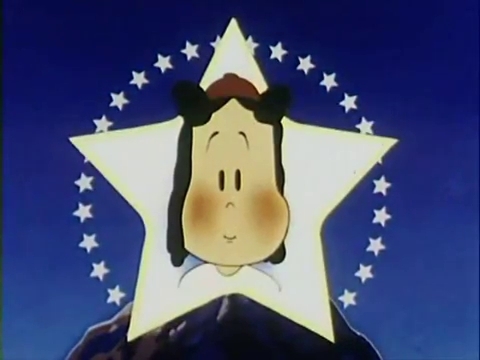 At its best, particularly in the time-period of the "Lulu" animated shorts, Famous offered a refreshing, often visually spectacular counterpart to the West Coast animation houses. 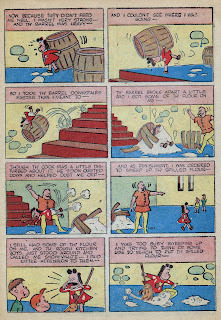 They carried on a hint of the vibe of the original studio, headed by the Fleischer brothers (Max and Dave). Highly recommended is a new DVD from Thunderbean Studios that contains ravishingly restored prints of 20 early Famous Noveltoon cartoons. Many of these early Famous shorts fell into the public domain, and, until this DVD, have only been viewable in dreary, color-faded and corrupted TV prints. Seeing the cartoons via this DVD gives you a much clearer impression of how they looked when they were new--and what a curious, distinct flavor Famous' early output has to offer 21st century viewers. 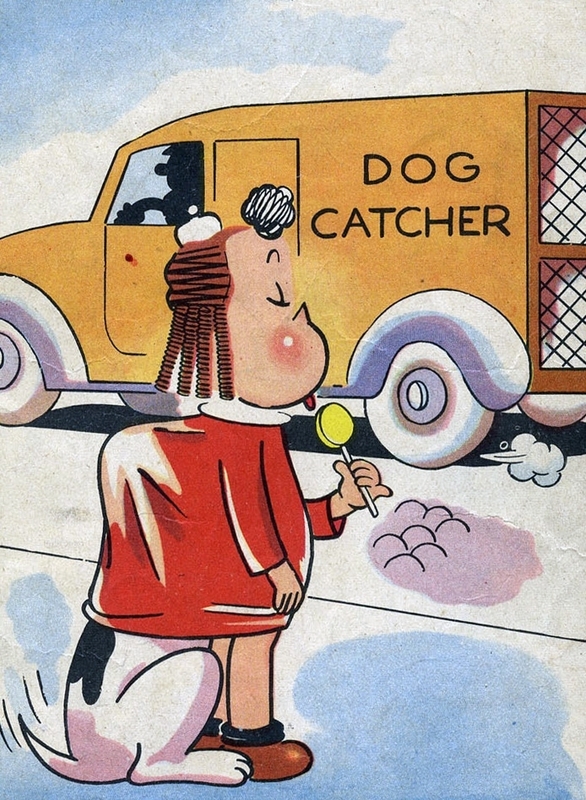 The first few "Little Lulu" shorts were among the last cartoons produced at the studio's Miami, Florida outpost--the last bastion of the flagging Fleischer studio. 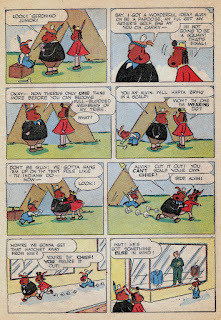 Most of the screen "Lulu" cartoons were created in New York, near to where John Stanley wrote (and drew) his entirely different take on the Marge Buell character for Western Publications. Though Famous had a two-year head start on the Buell property, it is fascinating that, in the same general area, at the same general time, two different creative teams were at work on their interpretations of a popular pop-culture figure. That such different results should emerge from these two factions says more about the different dynamics of animation and comics than anything else. 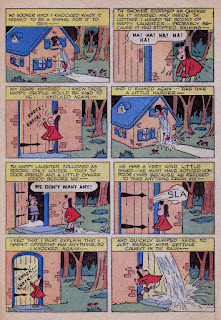 Famous' version of Little Lulu is not at all like John Stanley's. 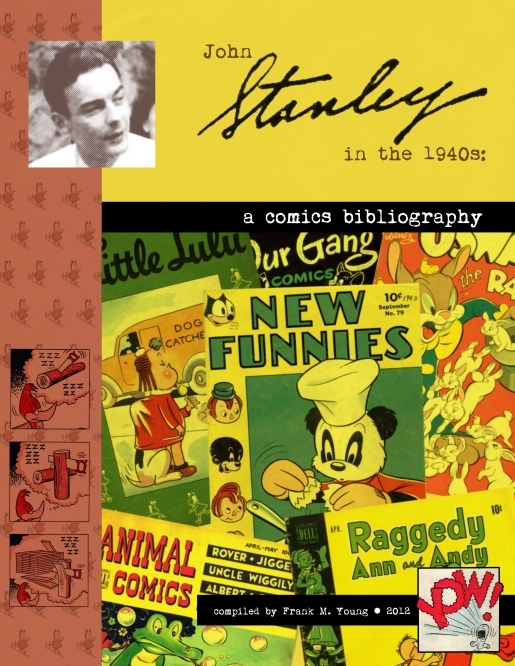 A comparison reveals some self-evident but important truths about what John Stanley brought to the table as a writer and cartoonist. Thanks to YouTube provider superleviathan, you can watch all 26 of the Famous "Lulu" shorts online, for free. He's gone to the trouble to restore original title sequences, when the elements were available. Though most are sourced from retitled 1950s TV prints, they're nice-looking versions, and offer a generally very good way to assess this large chunk of animation product. The biggest flaw of the Famous "Lulu" cartoons reflects the studio's most telling problem, which grew larger as the 1940s ended. Famous' reliance on stock formulas and scenarios slowly drained the life out of a promising cartoon studio. 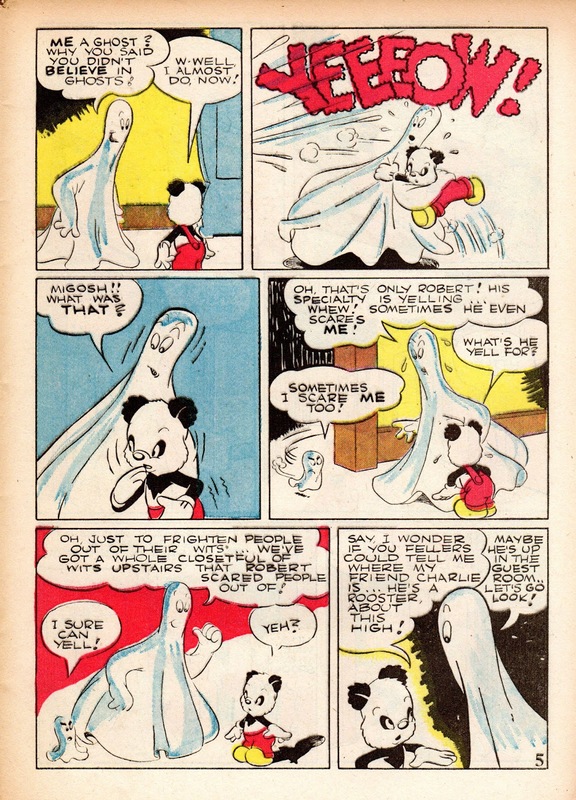 As characters such as Little Audrey, Casper the Friendly Ghost, Baby Huey and Herman and Katnip dominated the Famous output, so did recycled plots, gags and story arcs. Thus, when you've seen one Herman and Katnip, you've really and truly seen them all. Famous picked up some steam in the later 1950s, largely thanks to the innovative writing and design of Irv Spector, whose mordant wit and angular draftsmanship pushed Famous into the cartoon modern world. 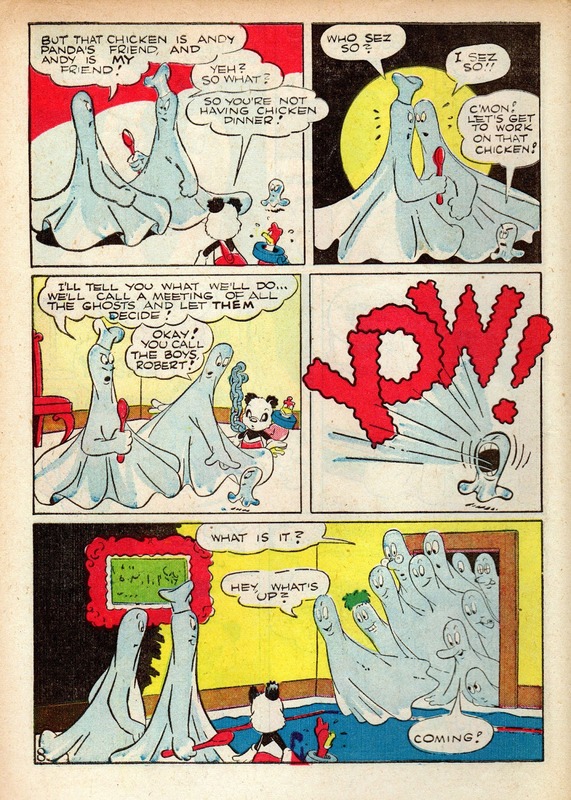 Resulting cartoons like Finnegan's Flea, Cool Cat Blues and Chew Chew Baby (the latter not currently viewable on YouTube, alas) offered a low-budget, eerie and comically vibrant alternative to the generally flagging state of theatrical animation. Famous was never 100% sure what to do with Little Lulu. 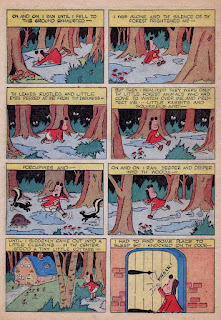 She was too low-key a character for wild exaggerated slapstick; she was too earthy for saccharine-sweet cute cartoons (thank the deity of your choice). Their initial impulse was to make Lulu a seemingly oblivious, understated trouble-maker. 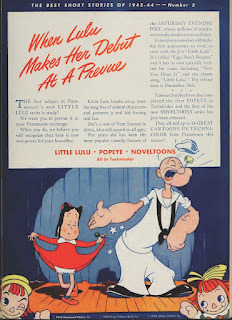 Charmingly voiced by Cecil Roy (a female voice talent who did several Famous characters), the animated Lulu was, initially, fairly close to the early John Stanley version. 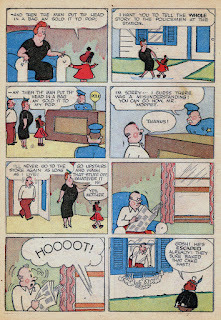 Less impish than Stanley's first iteration, the early Famous Lulu identifies herself as a child who's just curious about the ways of the adult world--and a bit baffled as to why her innocent actions make her parents, and other adults, so angry and perplexed. Like Stanley's Lulu, she is subject to frequent spankings. Like the Buell original, she is a subdued trouble-maker--an agent of chaos who is rarely aware of the effect of her actions. She innocently heckles the circus acts in Hullabalulu (1944), aggravates a train porter (1947's Loose in a Caboose), a department store manager (Bargain Counter Attack, 1946), a sleazy press photographer (1945's Snap Happy), a nearly sociopathic golfer (1947's Cad and Caddy) and, most frequently, her long-suffering father. 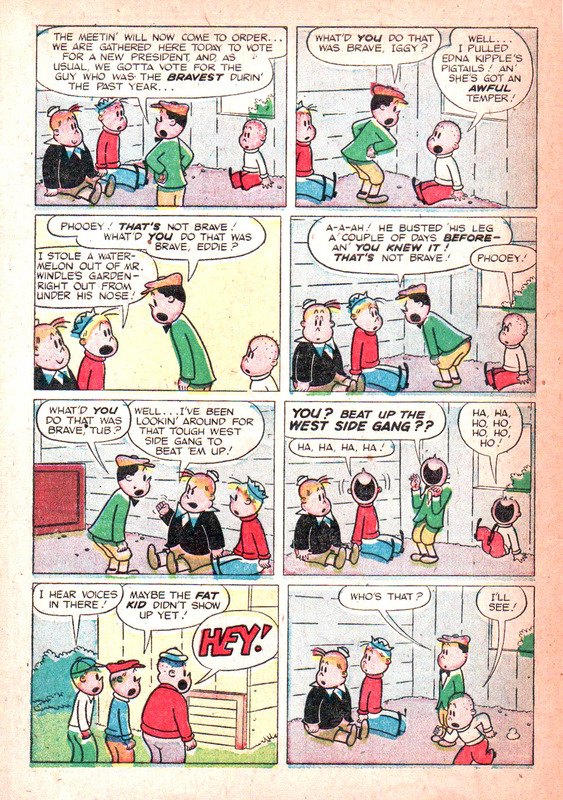 These male adult characters, usually voiced by Jackson Beck (best-known as the voice of Bluto in the Famous Popeye cartoons), tend to look, think and act alike. In some instances--particularly the Lulu cartoons directed by Bill Tytla--the angered adult's pursuit of Lulu becomes nightmarish, more akin to the notorious 1964 classroom scare film The Child Molester than to light-spirited cartoon hijinx. 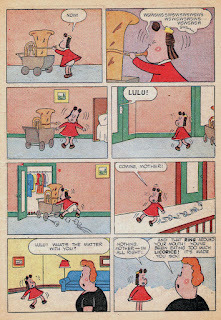 Lulu's early companions in the Famous series are a stereotyped black maid, Mandy, and a cartoon mutt who resembles an escapee from the Friz Freleng stock company at Warner Brothers' cartoon studio. 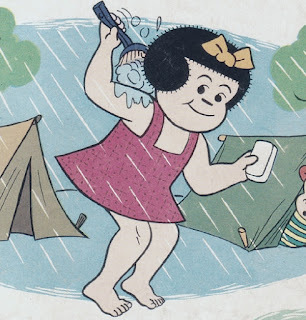 Despite Mandy's horrifying dehumanized appearance--a black button nose and lips akin to Fred Flintstone's five o' clock shadow--she is a strong character, and one longs, in later cartoons, for a less offensive variant of her. 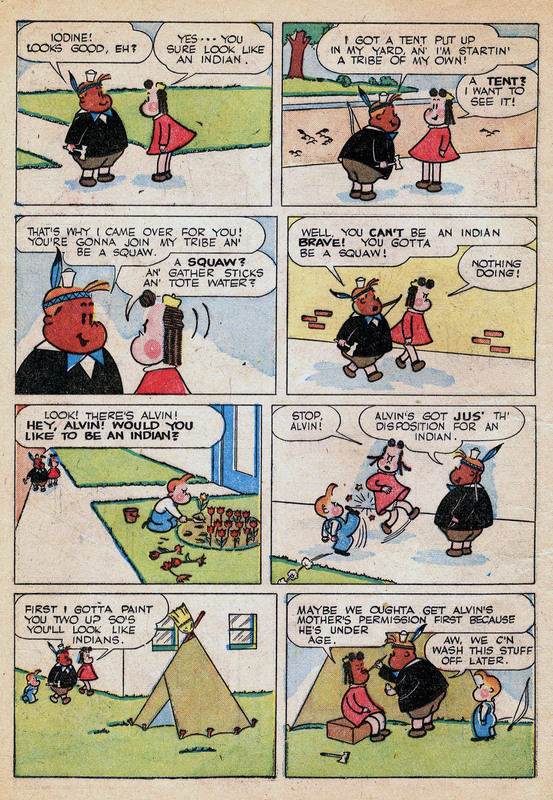 Similarly solid characters are sorely lacking in the Famous Lulu cartoons. Stock figures are in great supply, and, as the series progresses, so are stock situations. The finest Lulus come early in the series. Hullabalulu is a beautifully timed, amusing cartoon, with a simple situation milked for all it's worth. 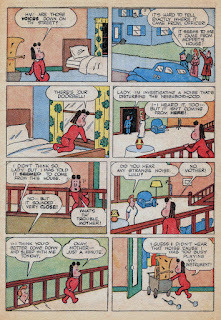 Lulu in Hollywood, the fourth cartoon in the series, achieves moments of deadpan brilliance. 1944's I'm Just Curious offers a charming original title song, a strong, unusual structure, and the most vivid sense of the Lulu character in the Famous films. 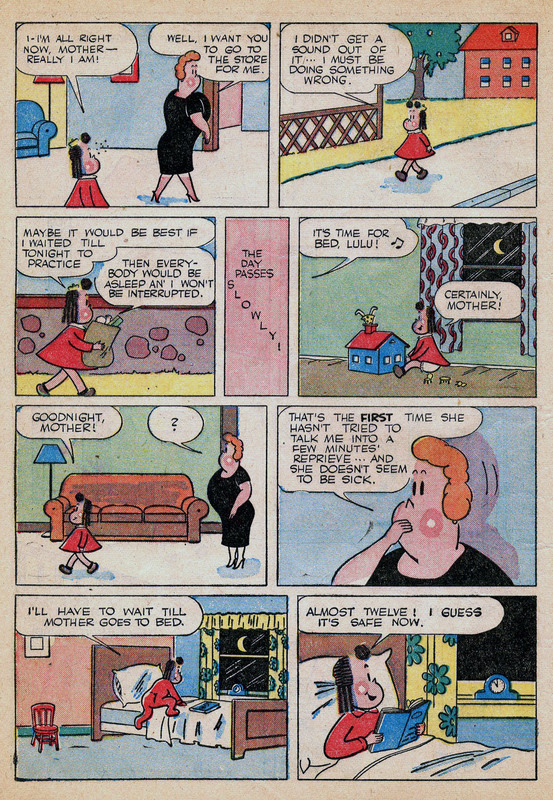 Rather than examine each cartoon for its relation to John Stanley's work, let's focus on the one Famous Lulu short that comes closest to the resultant comics version. Beau Ties, released in April, 1945, concurrent with Stanley's first Lulu comic book (itself cover-dated June, 1945), is the only short in the series to play off the relationship between Lulu and Tubby Tompkins (called "Fatso" in this animated cartoon). 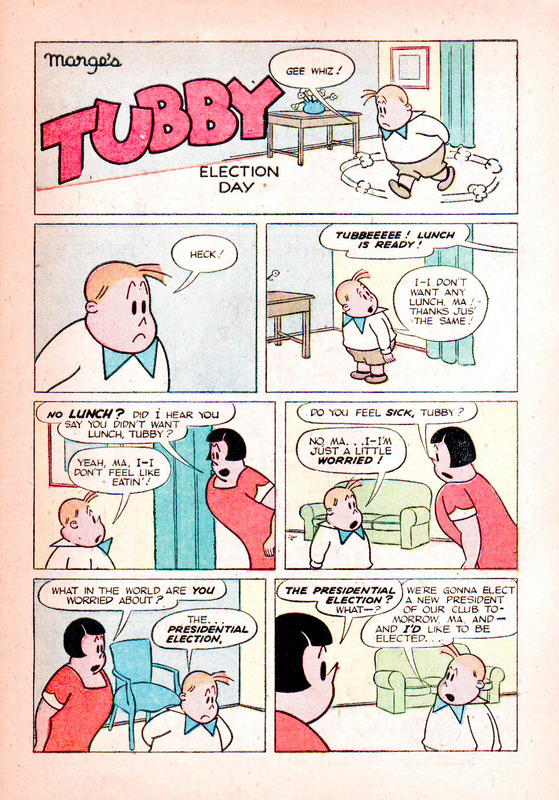 Tubby makes minor appearances in a few other Famous cartoons, but Beau Ties marks his only significant role in the series. 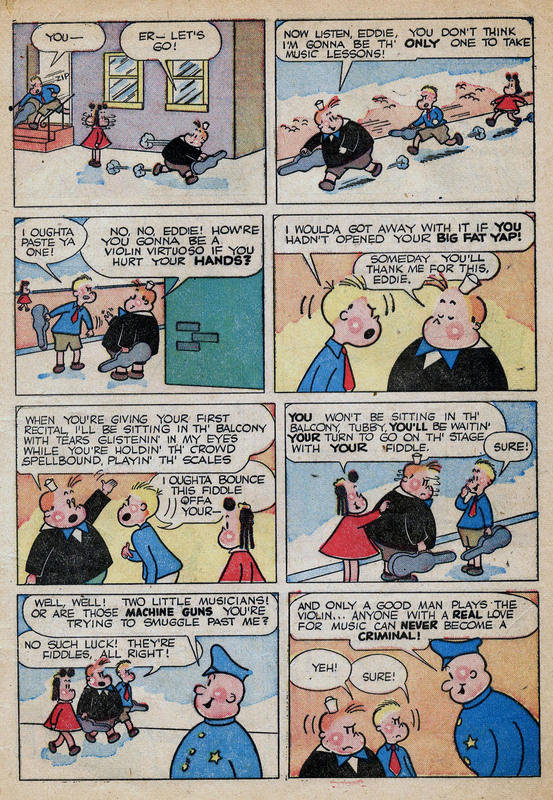 Voiced by Arnold Stang, "Fatso" shows some of the Quixotic self-assurance and duplicity of Stanley's Tubby. 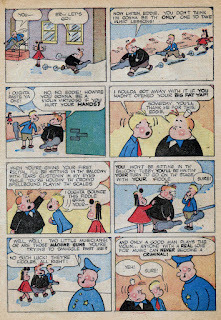 Though he quickly turns coward, and is physically dominated by Lulu, "Fatso" is an eerie prediction of the Stanley character. 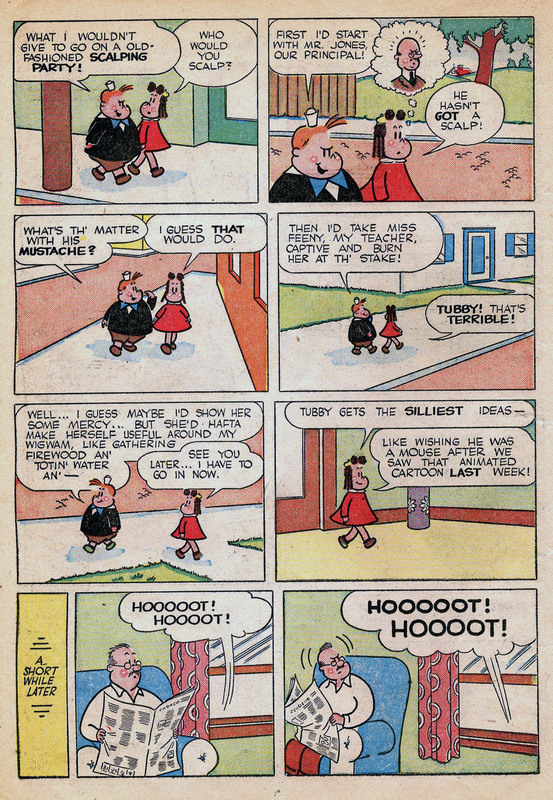 Famous' failure to seize upon the natural relationship between Lulu and Fatso/Tubby is the series' greatest tragedy. 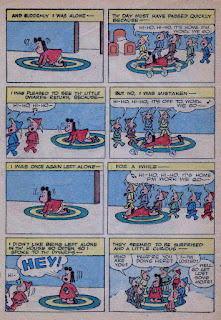 Although the cartoon traffics in the super-exaggerated, larger-than-life action available to 1940s animated cartoons, it is careful to focus on the relationship of the two characters. They are not stock antagonists, as are the menacing, burly adult men who frequent the series. Their relationship has some real human stakes, and though it's all played for laughs, the viewer leaves with the impression that these two children genuinely like each other. 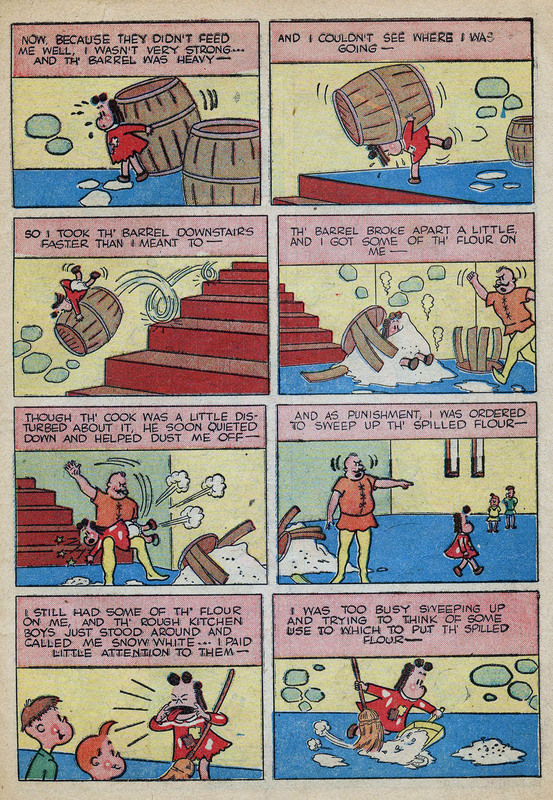 As the Famous Lulus degenerate, predictable and highly moralistic fantasy sequences become part of a joyless routine. 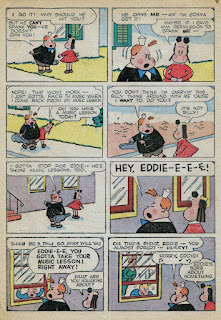 Lulu's lack of interest in music practice, in 1947's Musica-Lulu, sends her to a nightmare world of judgment and menace. Her attempted truancy in Bored of Education (1946) climaxes in a pro-education fantasy sequence set to the jazz standard "Swingin' on a Star." 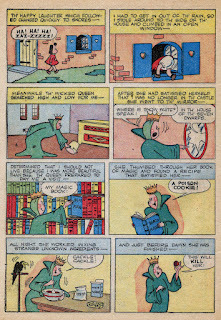 Lulu's banishment from comic book reading, in 1947's Super-Lulu, sets off a dream sequence that mashes up "Jack and the Beanstalk" and the tropes of super-hero comics. This lapse into formula was, alas, SOP for post-war Famous Studios. Though the cartoons are beautifully animated, and have moments of mild inspiration, their cessation of original themes, approaches and ideas become stultifying. There are exceptions to this rule. 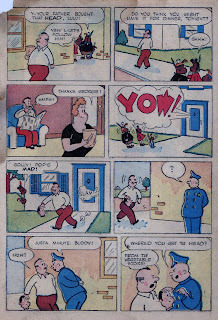 Bargain Counter Attack is hard-edged chase comedy worthy of Warner Brothers' Friz Freleng. 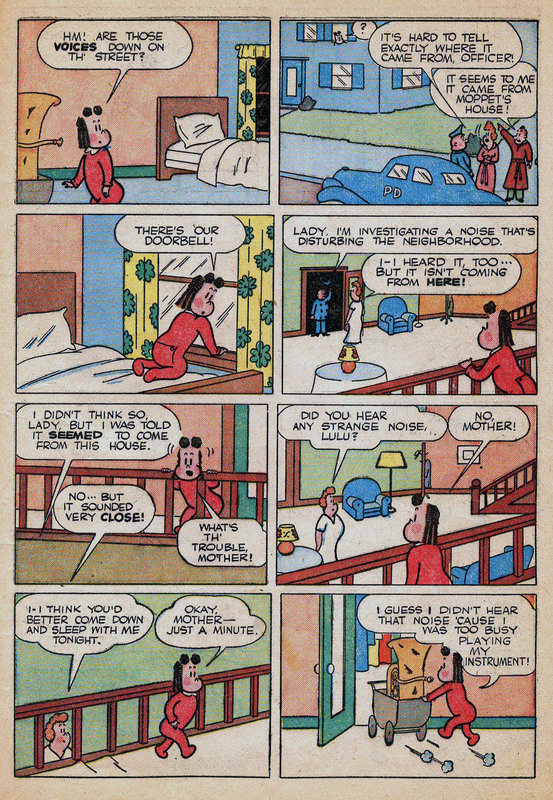 The penultimate Lulu cartoon, The Baby Sitter, captures some of the vibe of Robert McKimson's early directorial efforts at Warners. Such cartoons show that Famous still had some comedic cojones, despite the falling-apart of their original high ambitions. 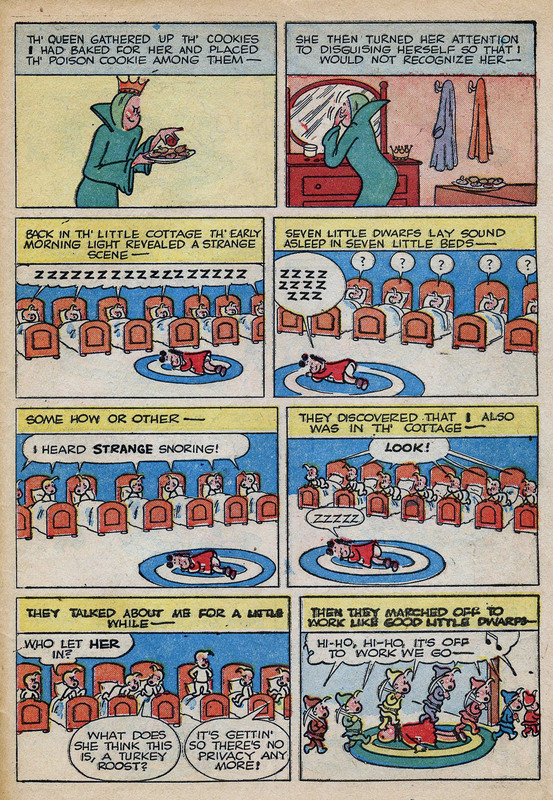 When Famous' five-year license on Lulu expired, in 1948, the studio, in an eerie reprise of Lulu's own creation, slapped together a simulacra called Little Audrey. Audrey immediately went to bed with the Famous formula machine. 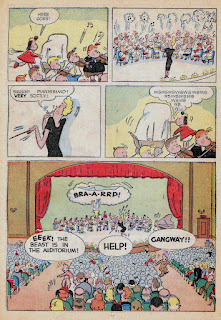 With her horrifying, mechanical laughter and the cloying morals of her fantasy sequences, the Little Audrey cartoons are, to quote Thad K., "funny as AIDS or nuclear war." 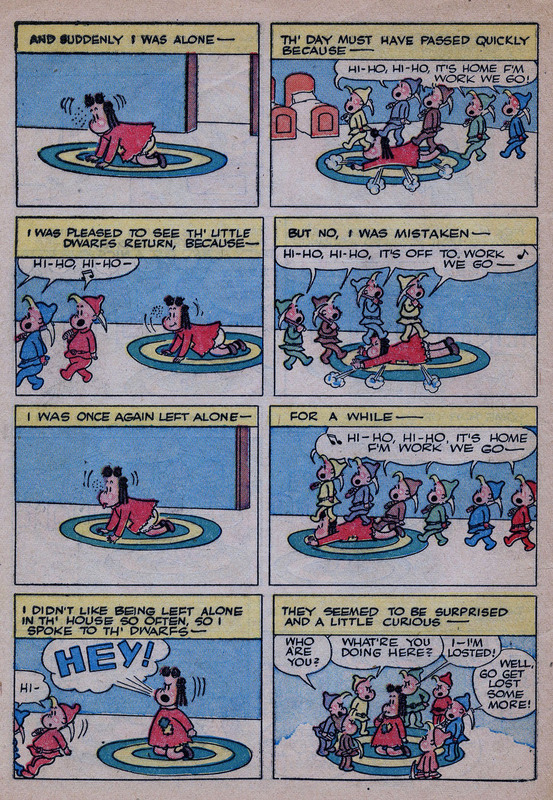 By this time, John Stanley and his crew really and truly owned Little Lulu and her world. Famous would attempt two more "Lulu" cartoons in the early 1960s--each adapted from a John Stanley comic book story. 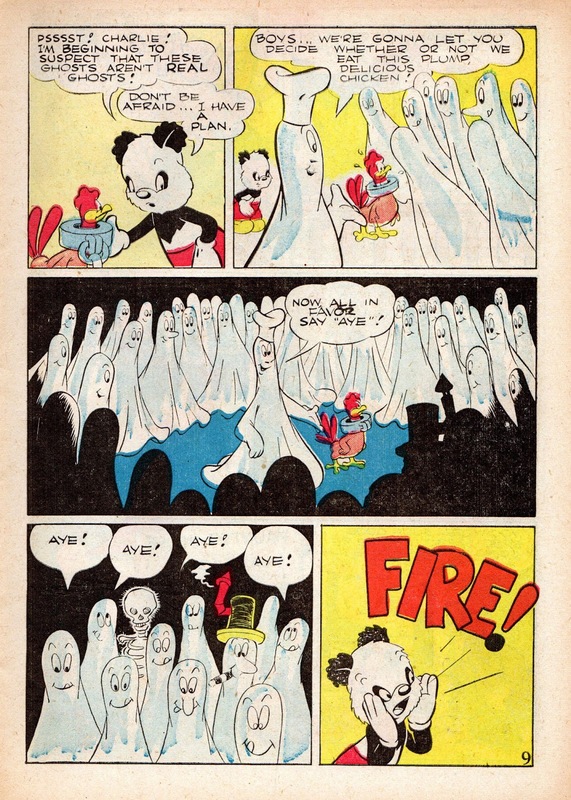 You can find posts about those cartoons--with links to the films themselves--elsewhere on this blog. My experience of viewing these 26 cartoons gave me an important insight re John Stanley's work. 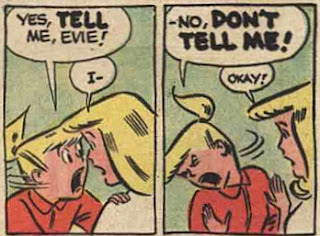 His sense of humor, his characters, situations and stakes are entirely earthbound and capable of happening to you or I. Stanley siphoned off an evident interest in the supernatural into the series of on-the-fly stories Lulu tells to her bratty next-door-nabe, Alvin. Ghosts tiptoe into some of the early Stanley Lulu stories, most notably 1946's "The Haunted House," also readable elsewhere herein. 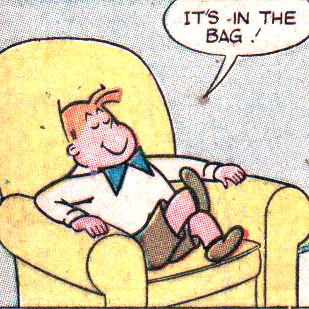 By 1948, Stanley is careful to couch such incidences in a cloud of ambiguity. 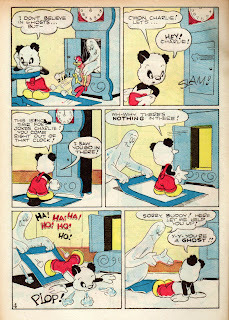 In one of his masterworks, 1954's "The Guest in the Ghost Hotel" (Tubby #7), the vagary of events is handled with great narrative skill. 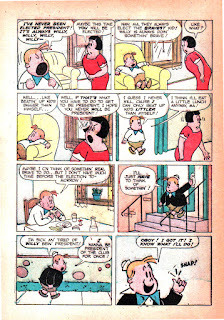 Did the events of this story really happen, or did Tubby's runaway-train imagination cobble them together? 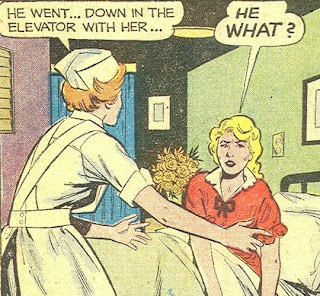 Multiple readings of the story fail to ease its lovely ambiguity. 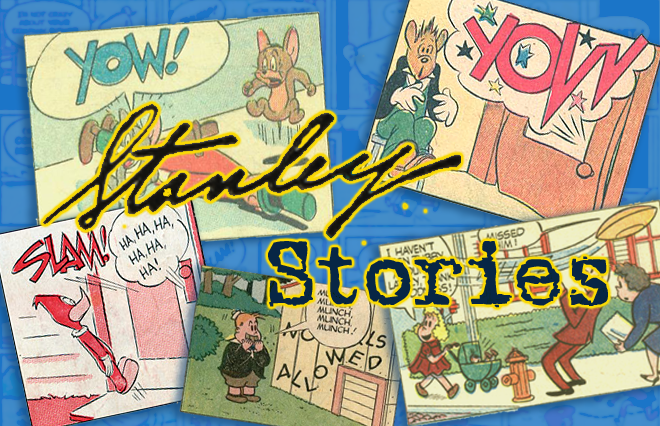 Are Stanley's "Lulu" stories superior to Famous' cartoons because they're more earthbound? Yes and no. They work because you give a damn about the characters. Over the course of reading Stanley's "Lulu" stories, you get to know the characters, for good and bad. All their flaws and virtues are laid out. Their shortcomings become part of who they are, and we accept them because we know them. In comparison, the Famous Lulu barely exists. Missing is that inner fire that makes a fictional character believable and engaging. We enjoy seeing her frustrate the ringmaster of the sleazy circus in Hullabalulu because she's absolutely right in her chorus of "it's a fake!" We like her in Beau Ties because she clearly cares for Fatso, despite himself. But she ceases to exist the moment her cartoons end. Other animated characters, especially Warner Brothers' Bugs Bunny and Daffy Duck, were given rich shadings of character and motivation. Like Stanley's Lulu, they achieve a sense of relatable personality. Stanley's Lulu, in contrast, stays alive in the reader's thoughts. She exists as a possible human being, and the events of her life are similar to ours. The darkness of her world also reflects our own experiences. 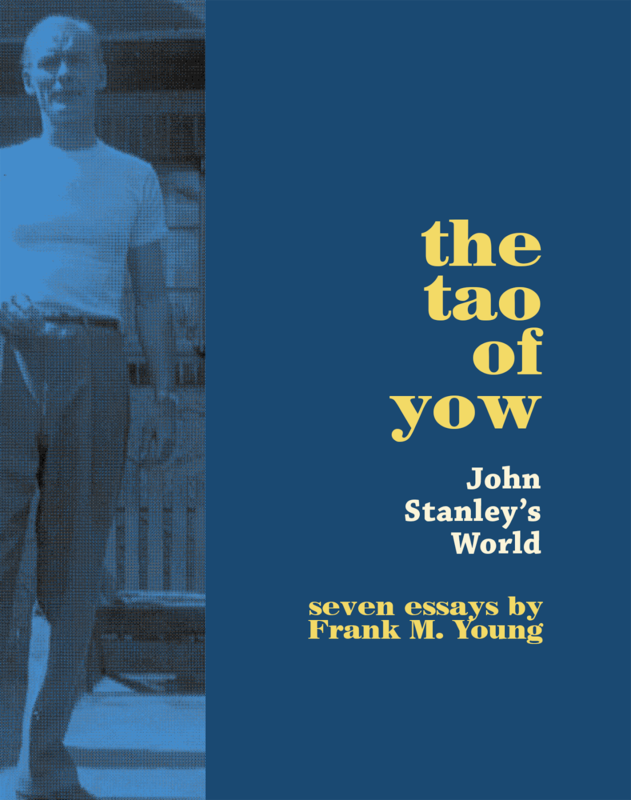 In this regard, John Stanley's depressive vision worked a positive effect. Outcomes in his "Lulu" universe are often miserable, disappointing or deflating. When things work out, we share in the characters' joy. Their victories are hard-won, as are our own. Thus, John Stanley's body of "Little Lulu" stories remain accessible, affecting and have currency, half a century (or more) since their creation. 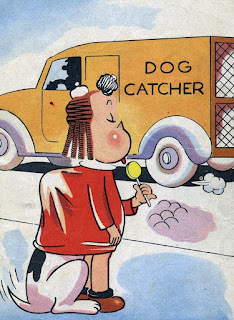 Famous' 1940s Lulu cartoons, though vivid, often charming and funny, fail to realize the potential of their character or her world, and substitute cheap laughs for moments that matter. 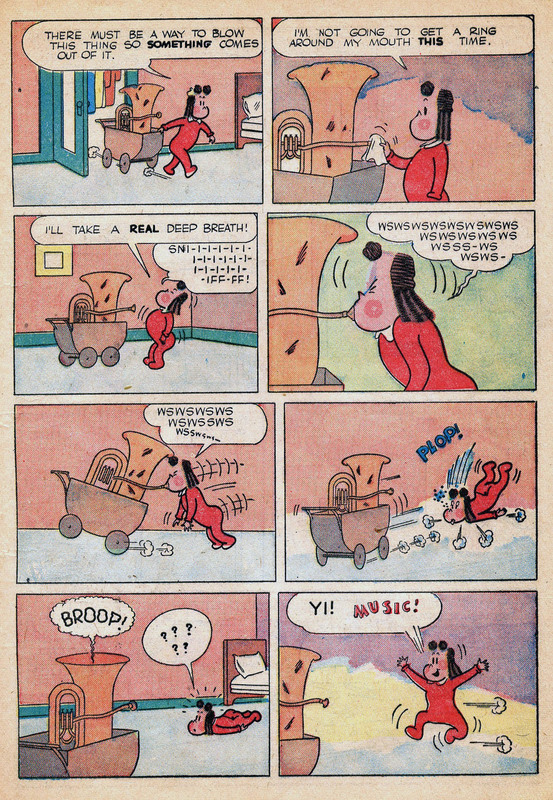 As animated cartoons, they succeed, on a lesser level than the Warners output, and are worth seeing, warts and all. 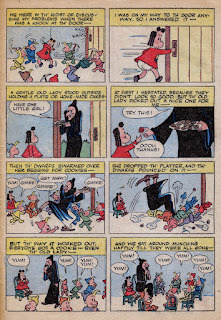 To compare them to John Stanley's version of Little Lulu is, perhaps, unfair. But the geographical proximity of Famous' cartoons and Stanley's emerging version remains fascinating. They deserve at least footnote status in the John Stanley story. 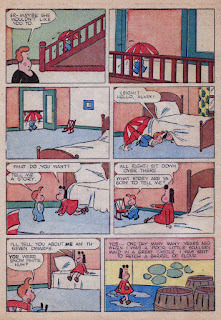 This continues a series of posts that focus on an issue of the John Stanley-written and drawn "Four Color" one-shot Little Lulu comic book. 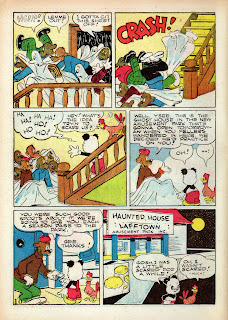 Here are three of the four stories that comprise Four Color #120, which bears a publication date of October 1946. 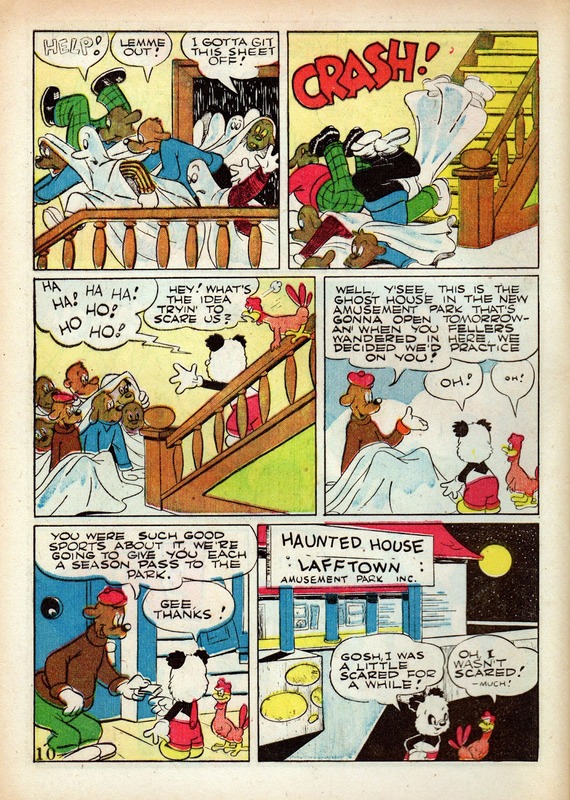 As ever, it's preferable to read these stories in color, as they were originally intended. 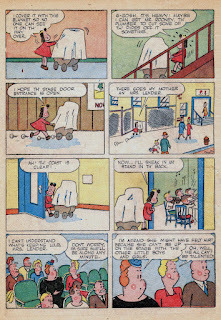 With this issue, John Stanley begins to take chances with the licensed characters of Marge Buell. 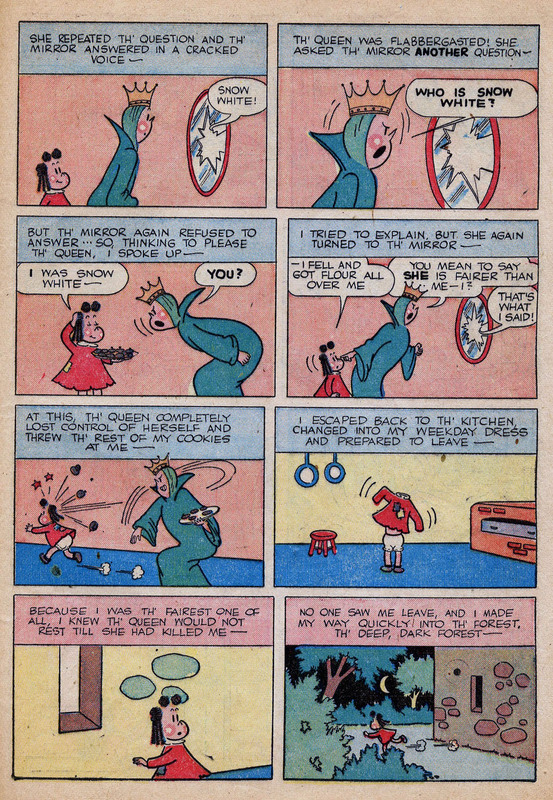 This is the most New Funnies-like issue of Lulu. 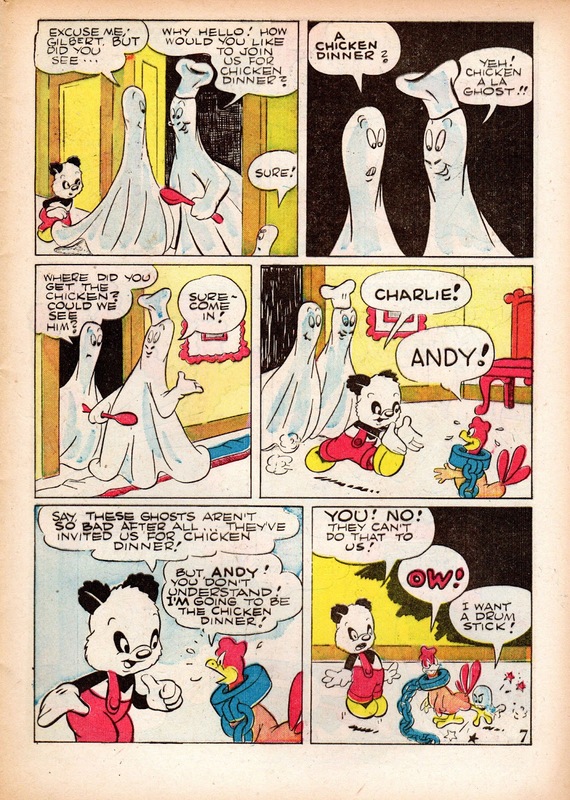 The story situations are quite akin to his contemporary "Andy Panda," "Oswald Rabbit" and "Woody Woodpecker" pieces. They're much less about character-driven comedy than broad, escalating situations. That said, Stanley's growing awareness of the potential of the LL cast further flavors these innovative stories. While Stanley the artist still struggles with the rudimentary/bad design of the Marge Buell characters, Stanley the writer cuts loose and tries for belly laughs and broader strokes. 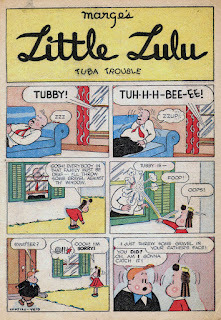 The issue's first (and longest) story, "Tuba Trouble," anticipates 1950s sitcoms. The narrative centers around a wacky decision Lulu makes, and sees through to its absurd but logical conclusion. 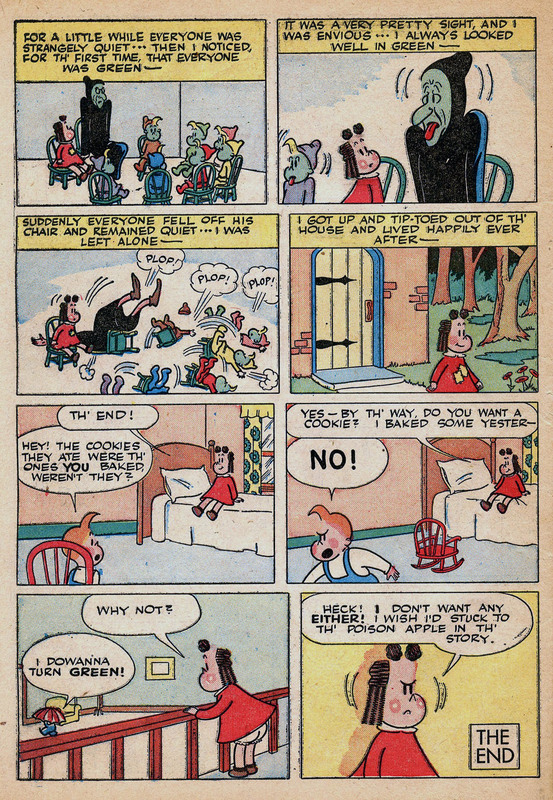 Stanley had a knack for this kind of story, and would return to this template more often in the 1960s. Stanley's sitcoms have more depth and patience than is the standard. 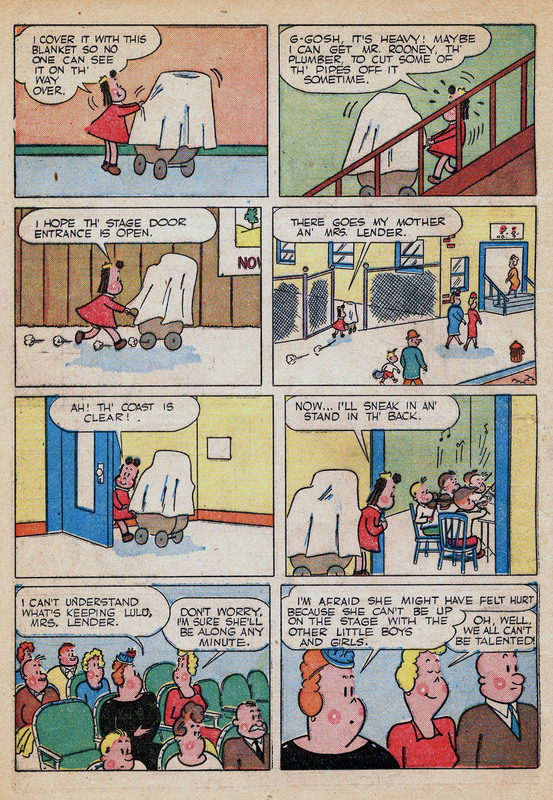 In this potentially I Love Lucy-style narrative, he is careful to keep character quirks in the foreground. There is always a sobering moment in Stanley's work. 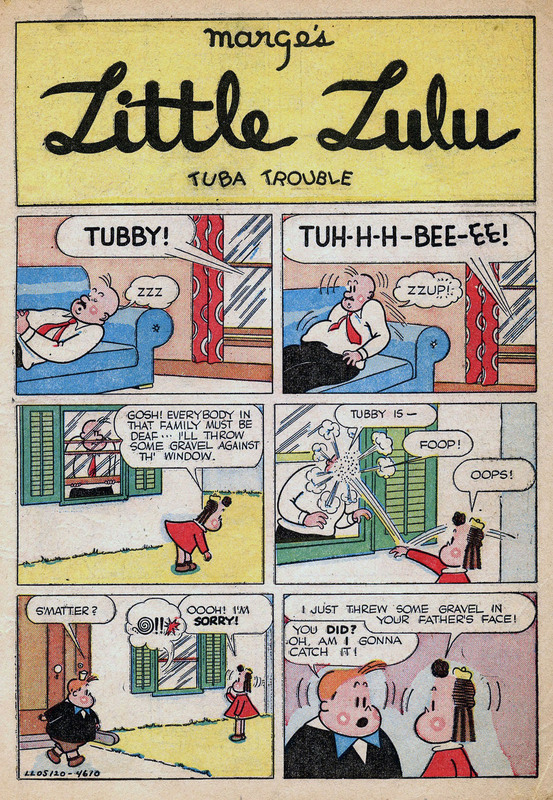 For "Tuba Trouble," it is the sequence on the top half of page 2. 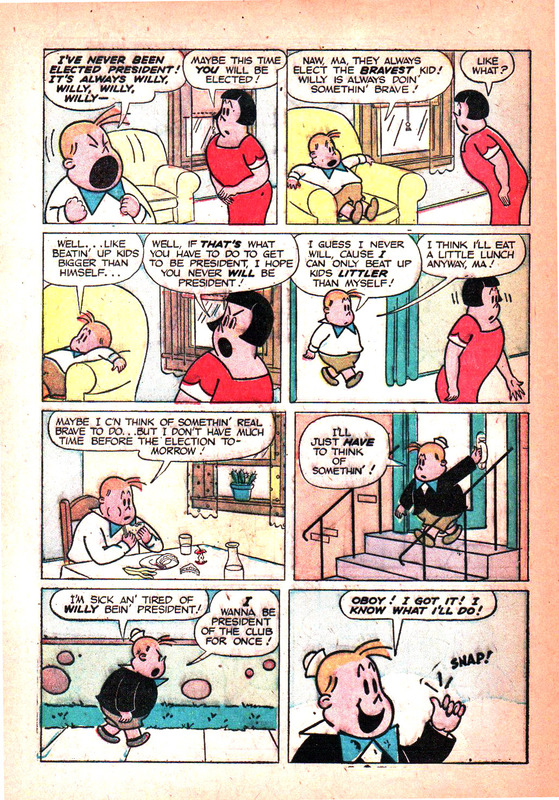 Tubby's notion that parents own their children, and that corporal punishment is inevitable, even for the misdeeds of his friends, adds that note of gravity prevalent in the Stanley universe. This early on, the kids' interactions with adults still have anarchic tinges. 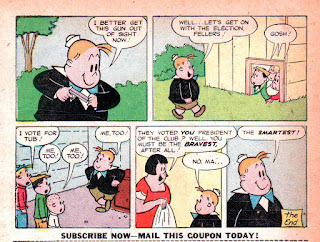 The Lulu cast would become conformists to social mores (with the important exception of Tubby) by the turn of the decade. Here, Lulu thinks nothing of hurling gravel through a window, or of stealing a neighbor's lawn mower to exchange for that decrepit tuba. Of course, she has her own logical rationale for each action. 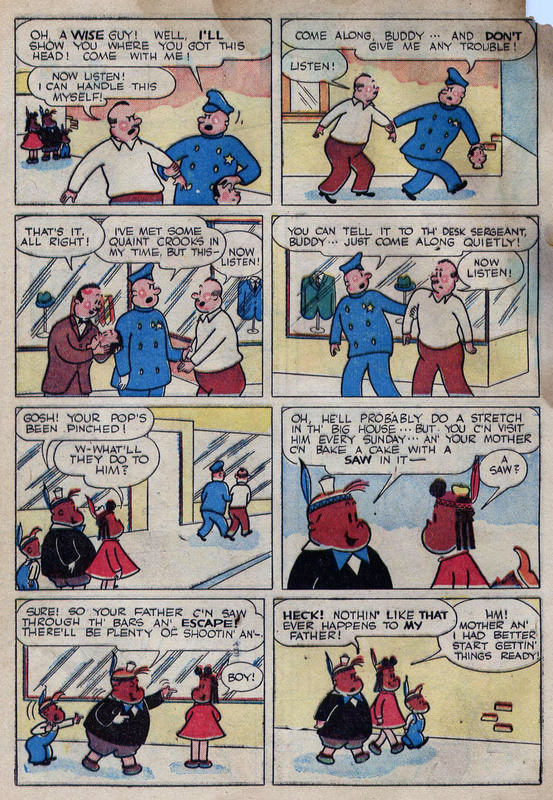 In this sense, the early John Stanley Lulu character is more like the Tubby of his 1950s stories. 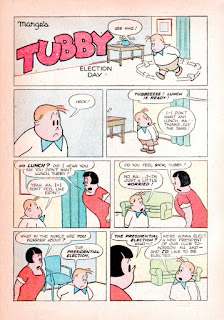 Tubby is far more passive in these earlier pieces. 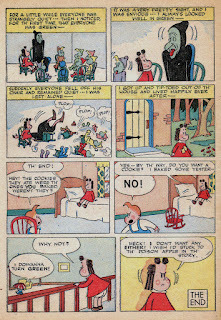 Once Stanley figured his master plan out, and assigned the self-deluded, self-justifying persona to Tubby, Lulu becomes a steadfast, feet-on-the-ground assayer of logic and reason. This was Stanley's greatest alteration of the Marge characters, and what makes them so far superior to her gag-cartoon iteration. 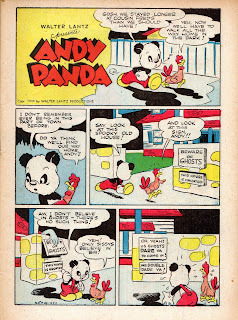 The tuba--and its audio pandemonium--is akin to Stanley's "Andy Panda" stories. It's easy to imagine that series' upstart, Charlie Chicken, being obsessed with the windy brass instrument, and causing a public panic with its startling farts. 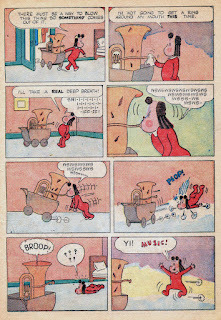 It is, of course, funnier to have a meek little girl behind this wind-breaking, and for her to be blissfully ignorant of the effect her tuba efforts have on the world around her. She simply wants to be included in her friends' pitiful music making. To the boys, music-making is an enforced torment, demanded of them by their seemingly irrational parents/owners. 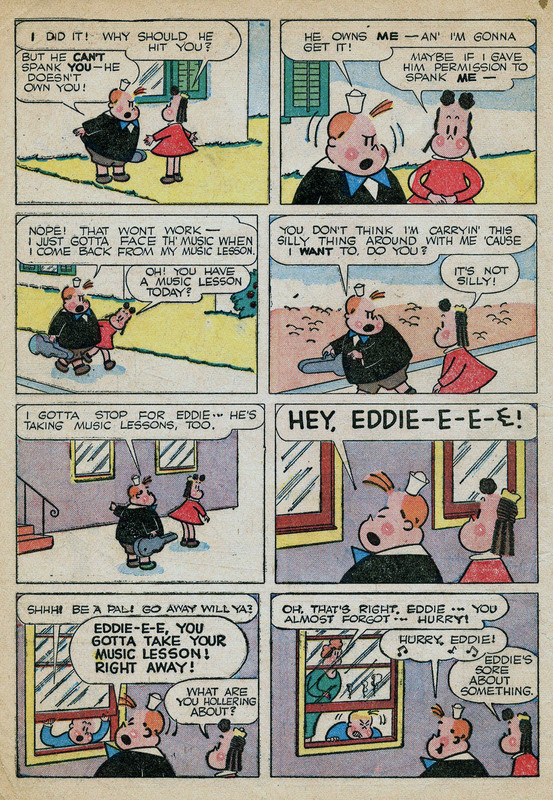 The beat cop's spiel about Sherlock Holmes may fortify Tubby and Eddie for the moment, but in the long run it's sheer hell for these kids, this music practice routine. The violin is a messenger of misery in John Stanley's world. Did he dislike the instrument? One wonders. A half-page scene of public chaos highlights the penultimate page. 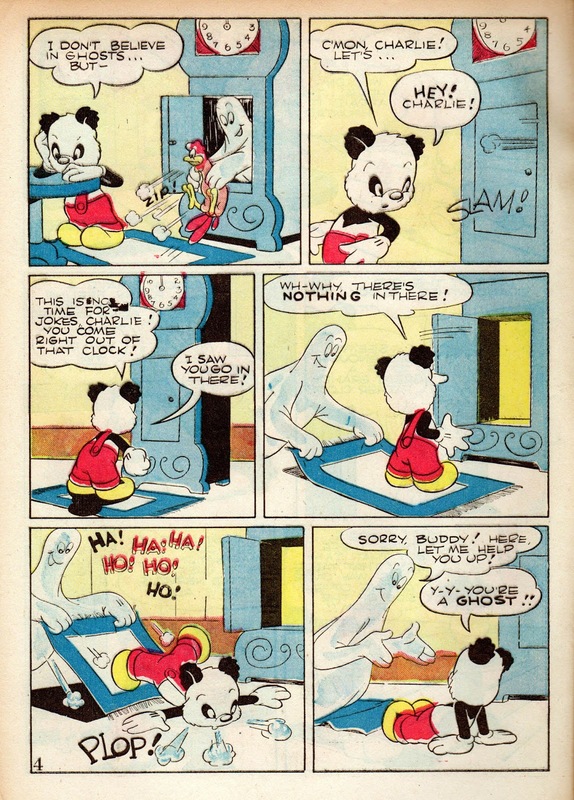 Far funnier, though, is that page's second panel. We can only imagine the discordance produced by those kids. 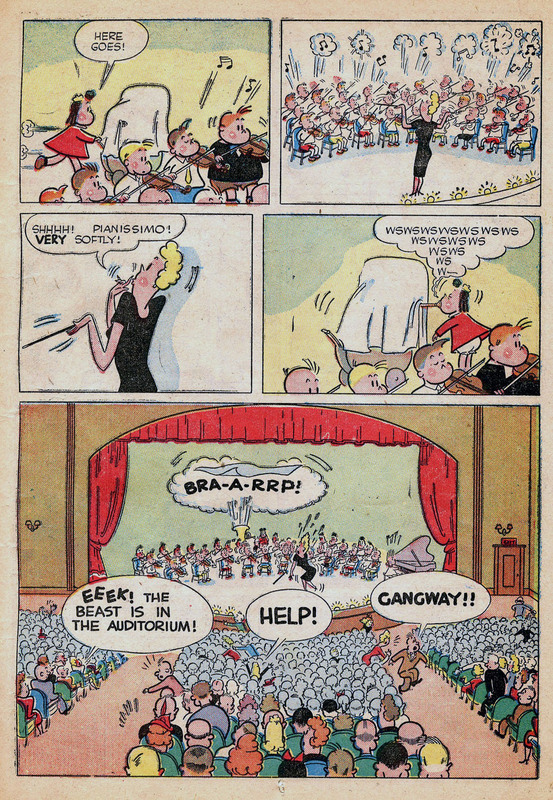 That Lulu's tuba-belching should outdo that cacophony is quite a feat. 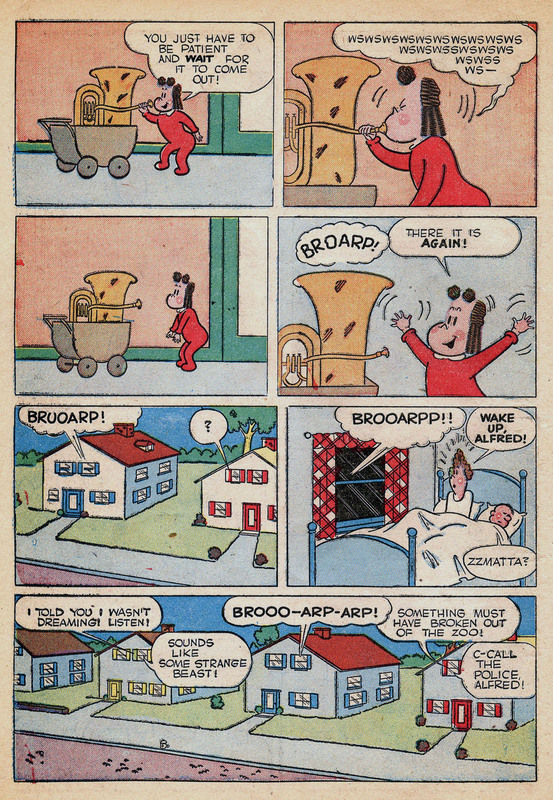 Stanley aims for a dry humor in "Tuba Trouble." It succeeds in understating its turbid events. 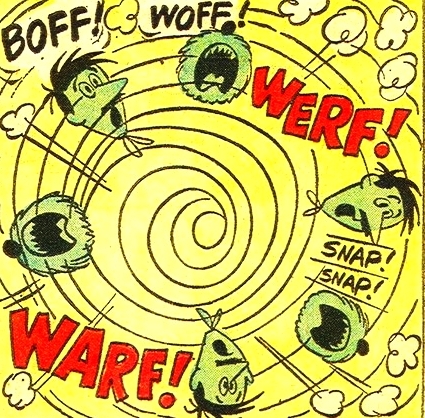 The effect is quite unlike his frenzied farces of the 1960s. 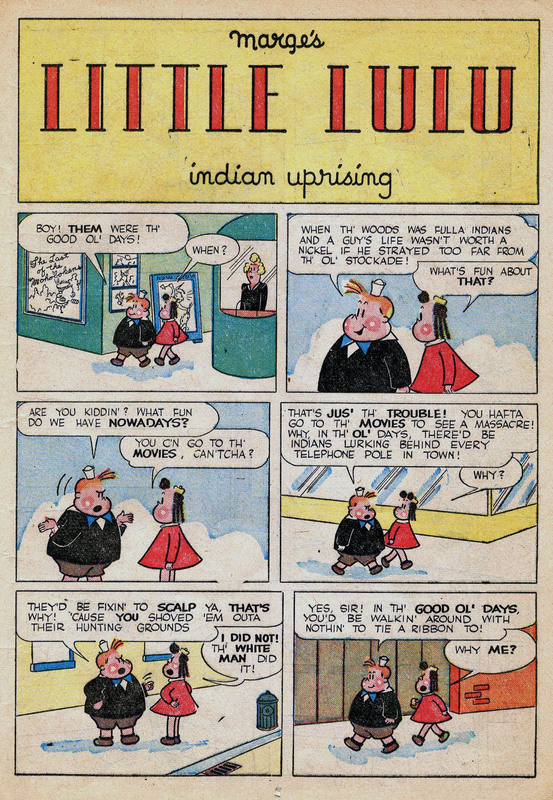 Next is "Indian Uprising." My apologies to any Native American readers of Stanley Stories. I have read all but three issues of John Stanley's output (and, thanks to Michael Barrier, I will soon have scans of those missing pieces). I have yet to see, outside of the notorious Li'l Eight Ball, a moment of outrageous ethnic caricature in Stanley's work. 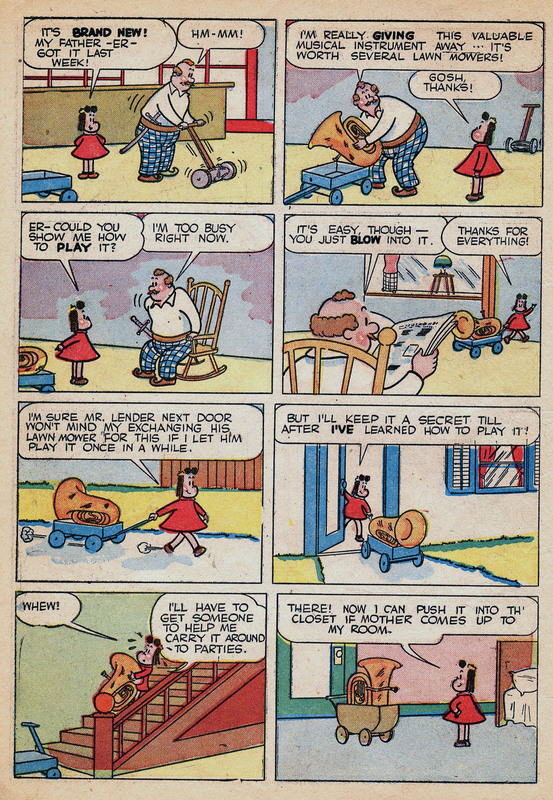 After a gander at the opening image of the first Famous Studios Little Lulu cartoon, Eggs Don't Bounce, Stanley's Li'l Eight Ball stories seem much milder in comparison. 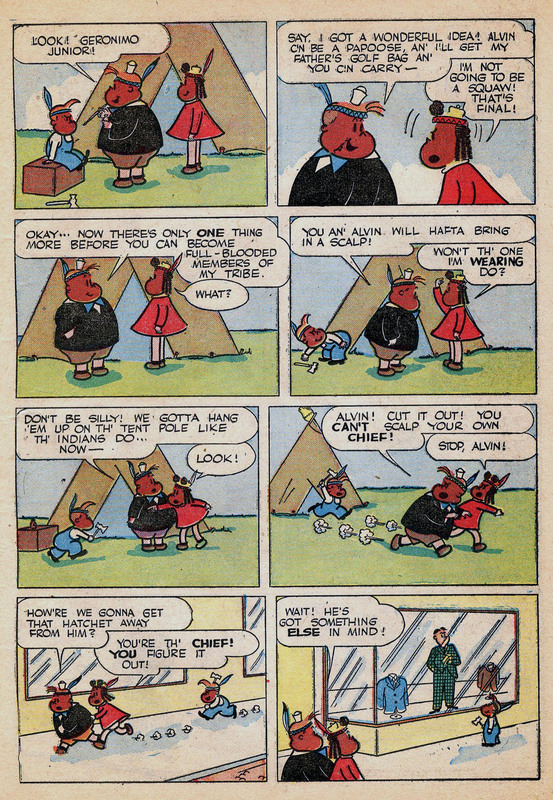 The one ethnic group Stanley used in his work were Native Americans. Making light of "injuns" far outlasted other ethnic ribbings. Only in the last 10-15 years has mass media backed away from the "how! ugh!" vision of the "redskin." No actual stereotyped Indians appear here--just their affect. 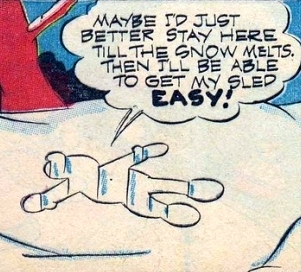 The kids' fantasies are fueled by the Hollywood crap that encouraged these stereotypes. This vicious circle, whether consciously planned or not, fuels one of the most topsy-turvy stories in Stanley's Lulu canon. 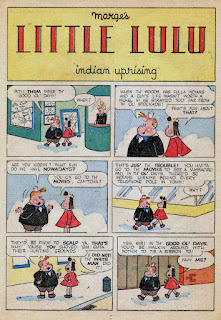 Few of Stanley's Little Lulu stories are as riotously funny as "Indian Troubles." Sublime comedic timing and techniques abound--once again relayed with understatement. From Alvin's quiet defacement of a tulip patch to Lulu's word-for-word explanation (repeated for the authorities) of how her father got a mannequin head, instead of a cabbage, every moment is beautifully downplayed. Tubby's boyishly vicious fantasy of the Old West, at story's beginning, gives further shading to his yet-unfinished persona. In this moment, this early Tub aligns with the mid-1950s model. As said, only the kids' use of iodine to darken their skin alludes to the "injun" theme. Notably, the kids are on the side of the Native Americans. They love the outlet to wreak havoc that the "redskin" persona provides. 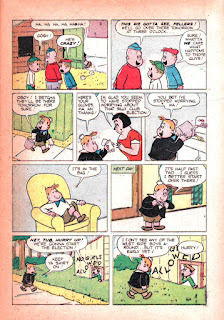 Even so, the children never lose their mid-century suburban American-ness. The contrast of their attempts to break from the societal mold, and the irritation and embarrassment they cause the adults around them, is sublime. No need to push the PC Alert Button this time! 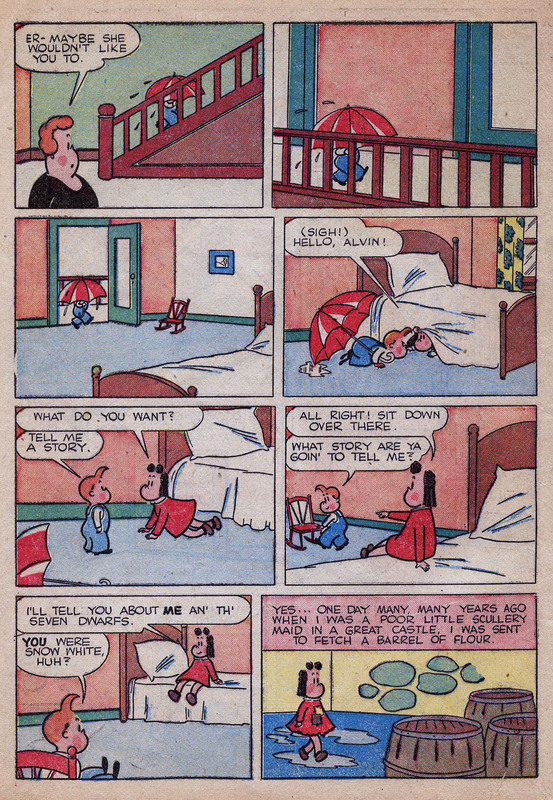 I've skipped the amusing "Newspaper Business" to conclude with an early instance of Stanley's meta-fairy tales. "Little Lulu and the Seven Dwarfs" is notable for its parody of the then eight year-old Walt Disney animated feature. With this cultural landmark as a compass, Lulu's selective corruption of remembered events and invented, personalized touches is laid bare for the reader to savor. Notice, as well, the second of John Stanley's witches. The first appeared in this 1945 Oswald Rabbit story. 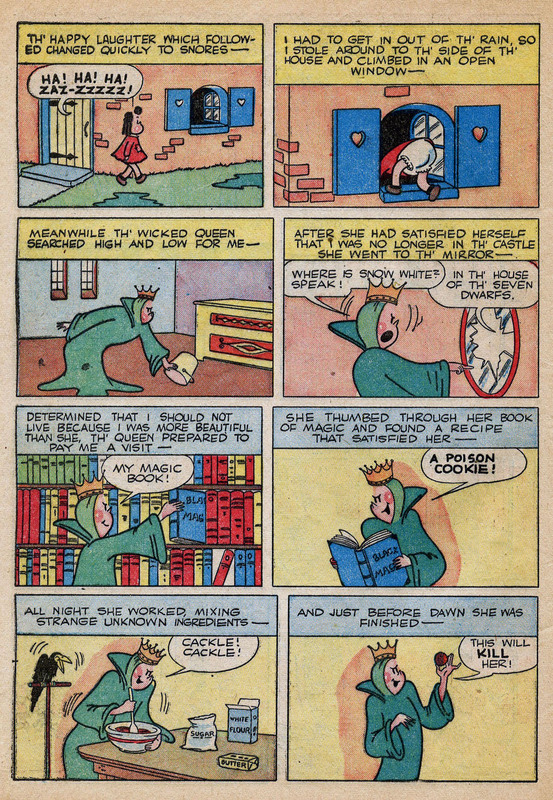 While clearly based on the source material parodied, this ur-witch, who meekly appears in the story's denouement, roughly anticipates his 1950s creation, Witch Hazel. From the start, Alvin is skeptical audience for Lulu's rewrite of "Snow White." 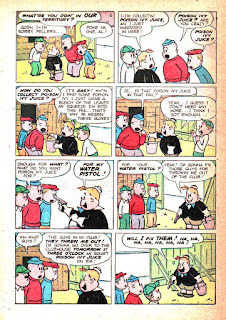 It's fitting that the "rough kitchen boys" and the seven dwarfs resemble Alvin, who is the biggest thorn in Lulu's side. 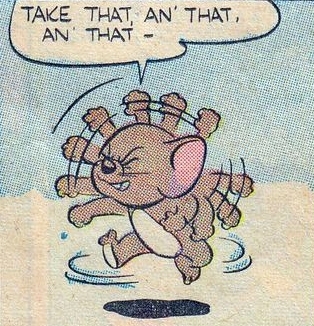 Stanley indulges in a rare quotation from pop culture. He has the dwarfs singing their signature song from the Disney Snow White feature, "Heigh Ho." 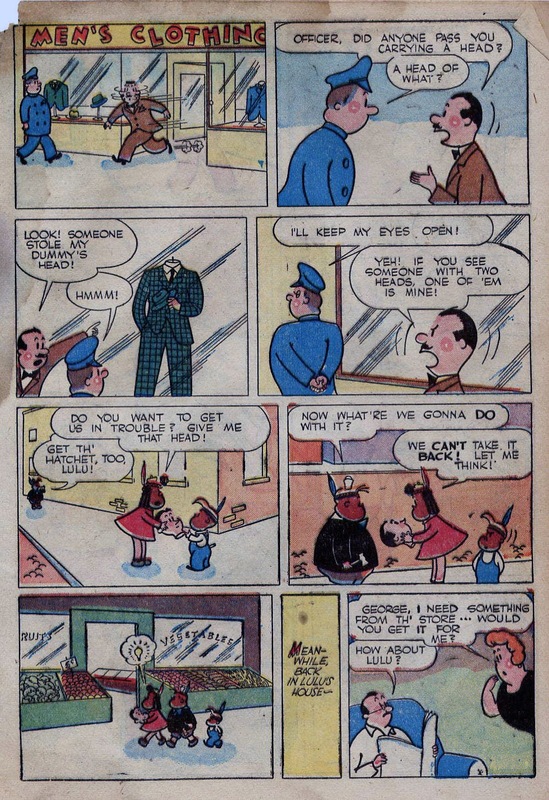 Litigation would ensue if anyone did this now, but in 1946, it probably passed by completely un-noticed. Lulu never strays far from her current reality in these on-the-fly fairy tales. 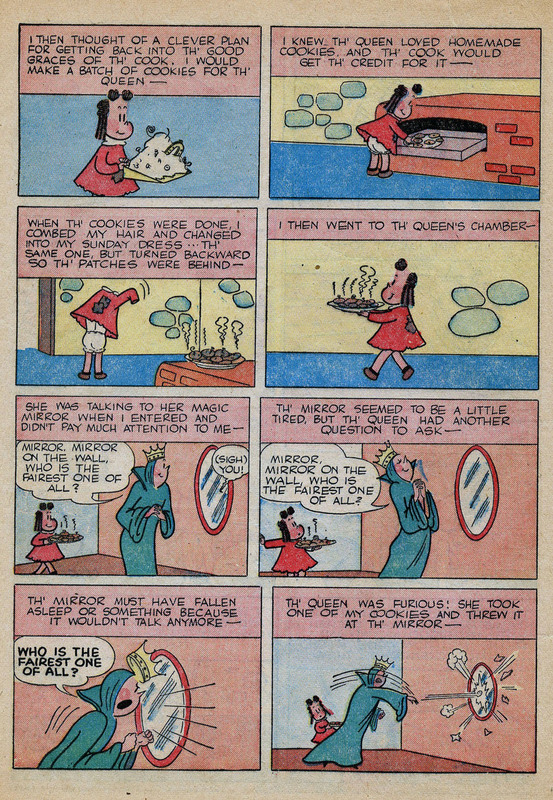 Her inclusion of poison cookies, a reflection of a recent baking episode, informs her parody of Snow White, and tidily ties the story's events together. This narrative decision ruins her appetite for the cookies she's baked--and thus the story ends, with story-teller berating herself for being too inventive. 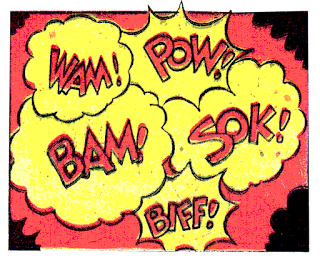 As work concludes on the long-awaited Carter Family graphic novel, I will be away from the blogosphere for the next month or so. When I emerge, I hope to have some fresh Stanley material to share with you. In the meantime, be well and prosper!